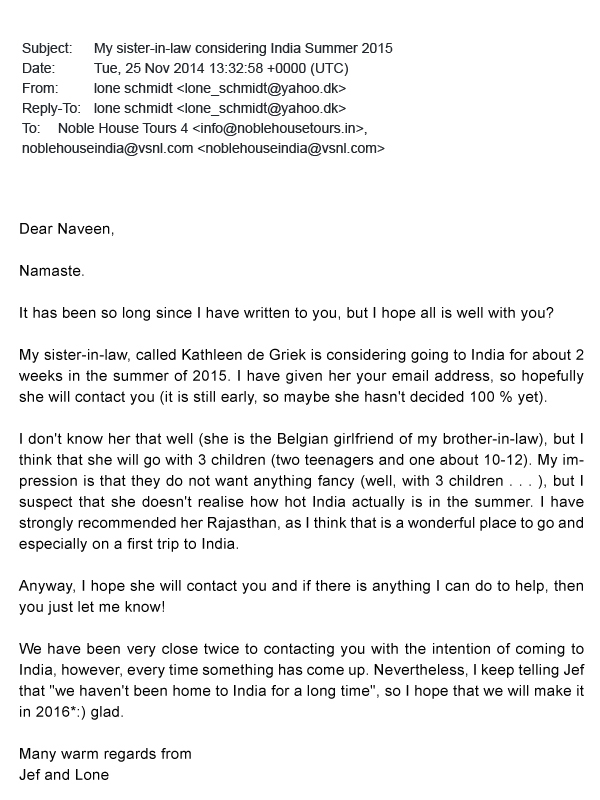 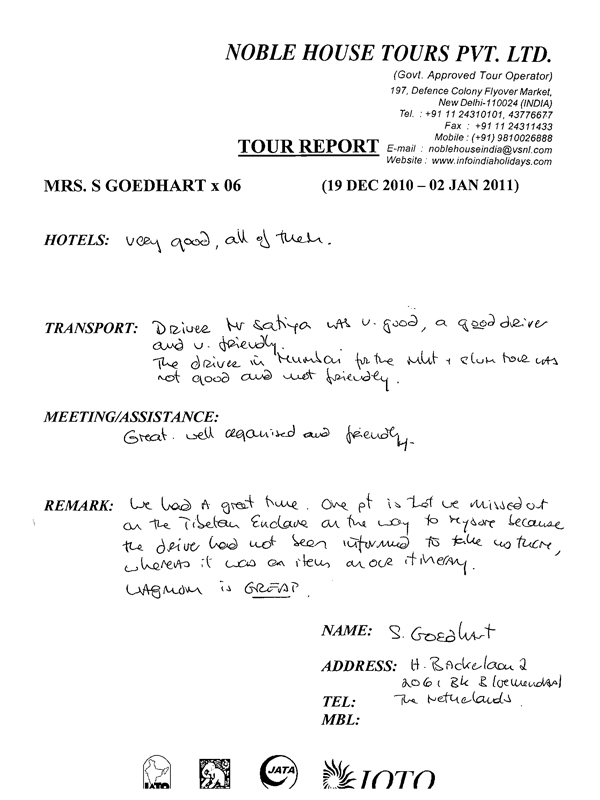 Mrs.S Goedhart has has given review about our services and hospitality.There view point about transportaion, services, hotels, drivers and guide is described here. 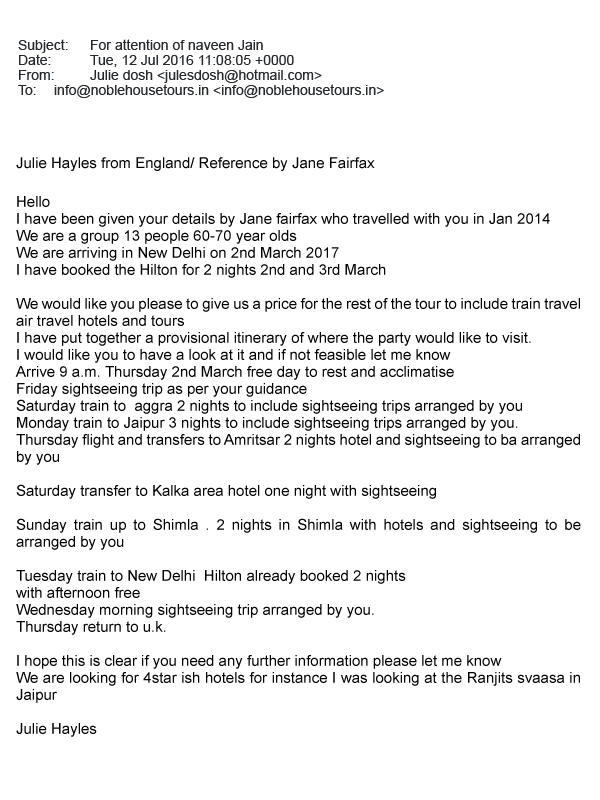 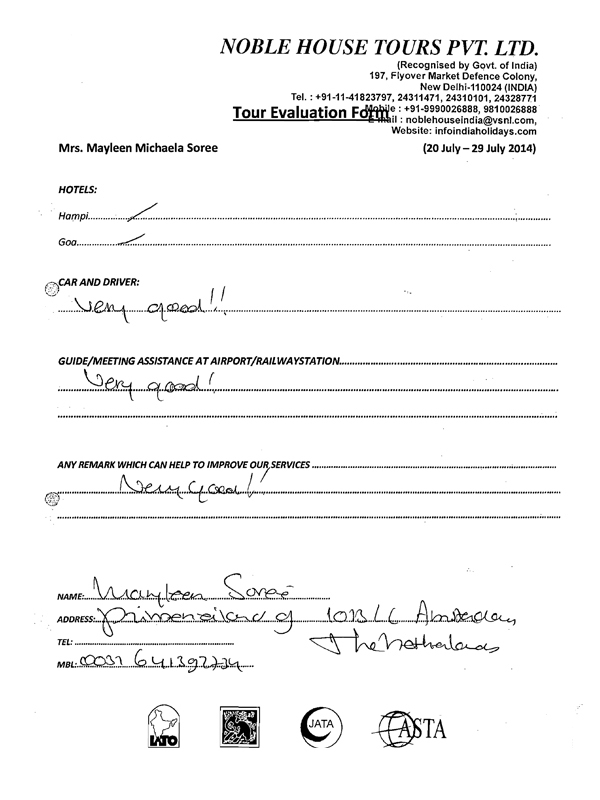 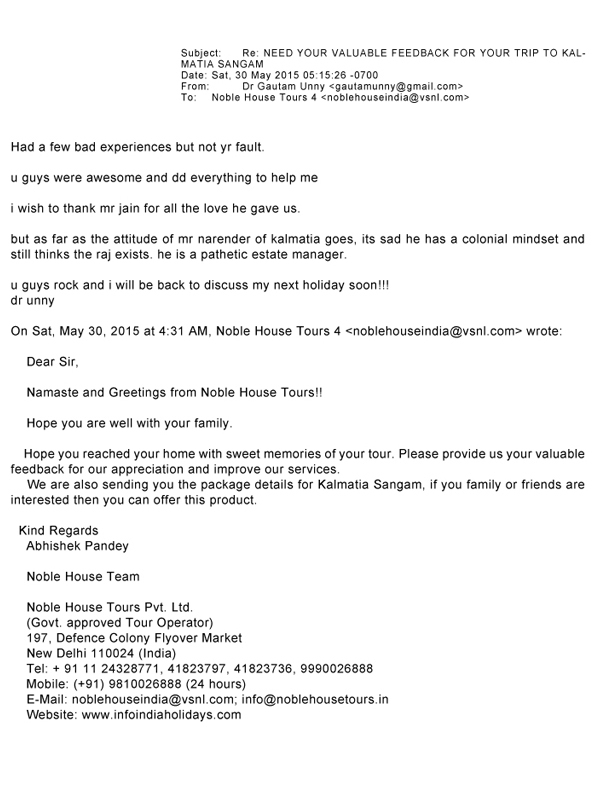 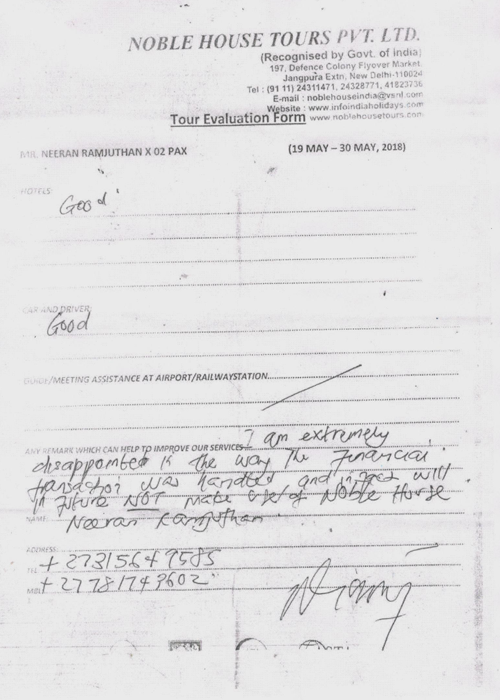 To read complete review please click on the image and get handwritten review by our clients. 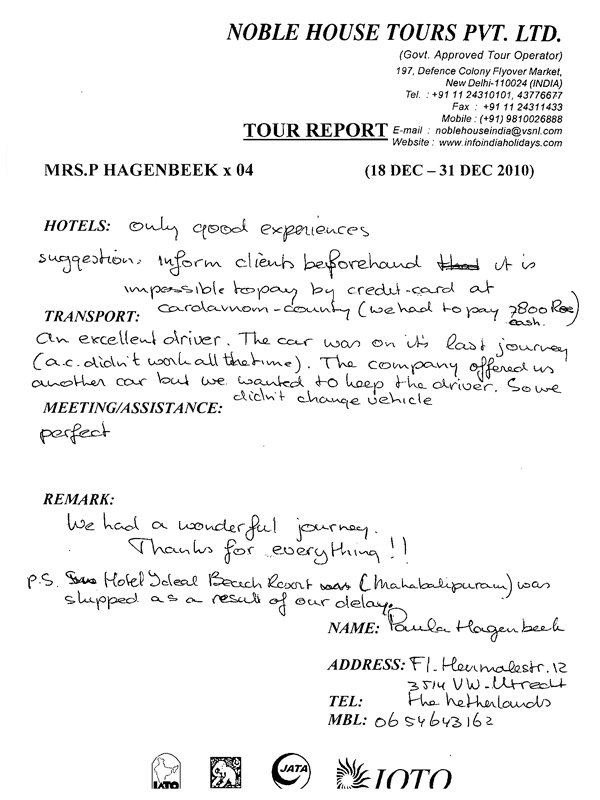 Mrs.P.Hagenbeek has given review about our services and hospitality.There view point about transportaion, services, hotels, drivers and guide is described here. 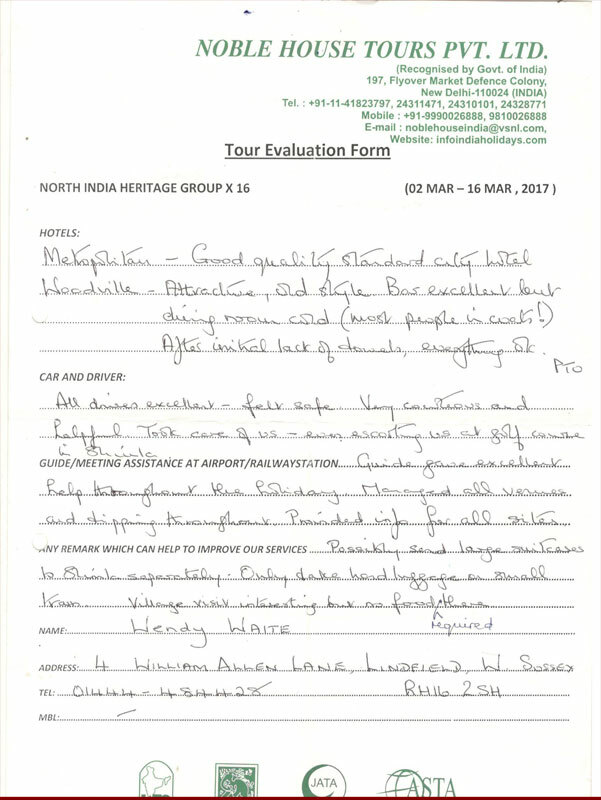 To read complete review please click on the image and get handwritten review by our clients. 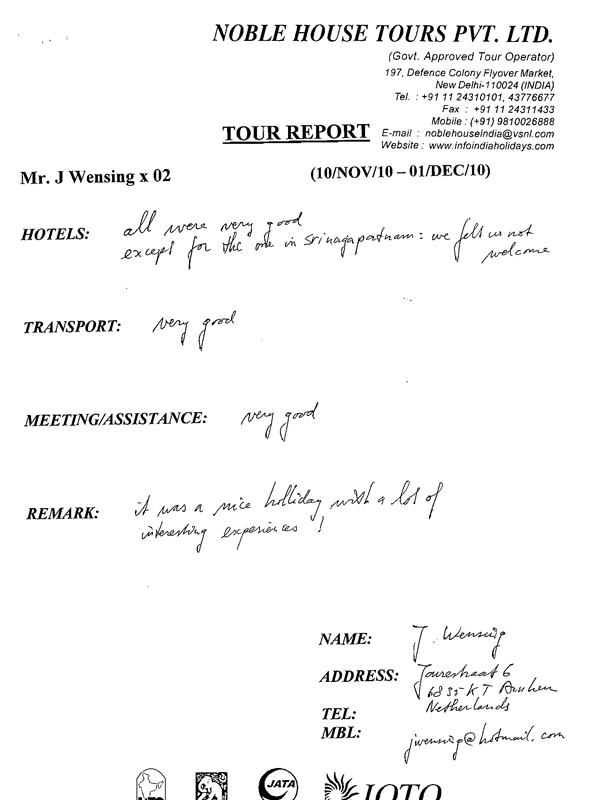 Mr. J. Wensing has given review about our services and hospitality.There view point about transportaion, services, hotels, drivers and guide is described here. 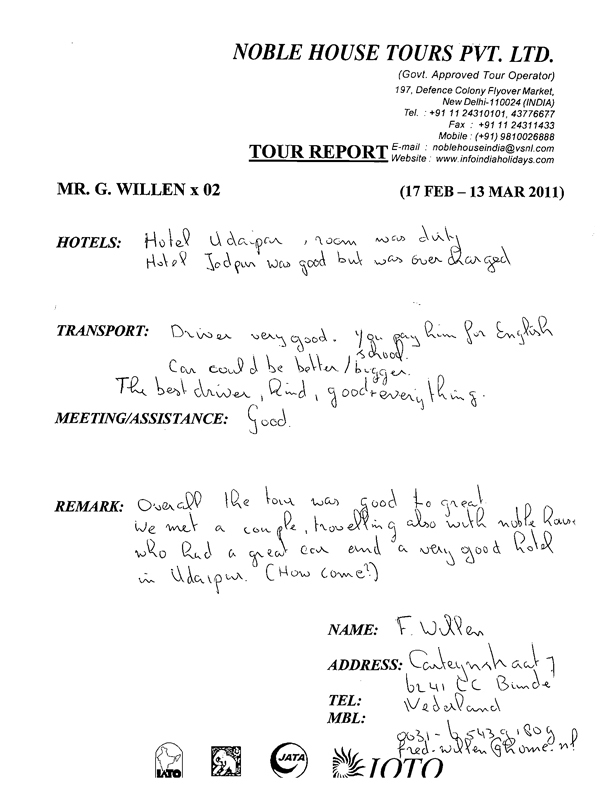 To read complete review please click on the image and get handwritten review by our clients. 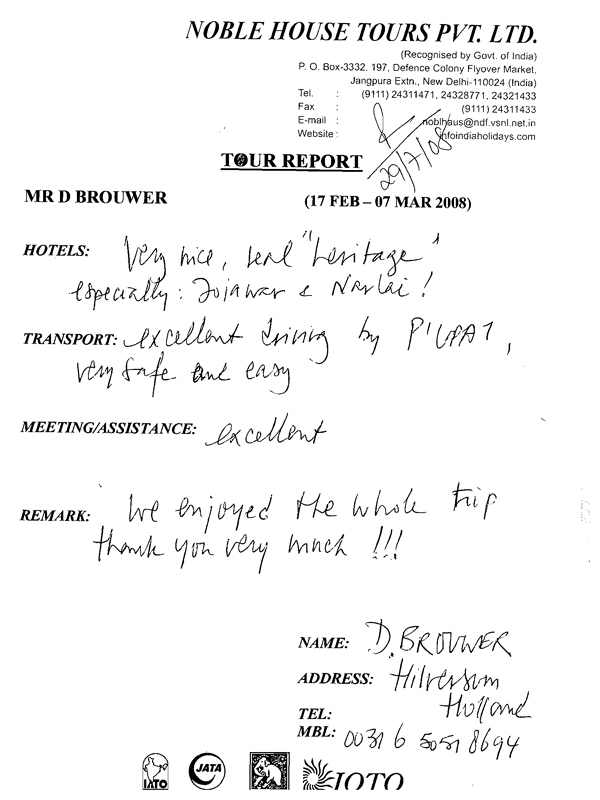 Mr. D Brouwer has given review about our services and hospitality.There view point about transportaion, services, hotels, drivers and guide is described here. 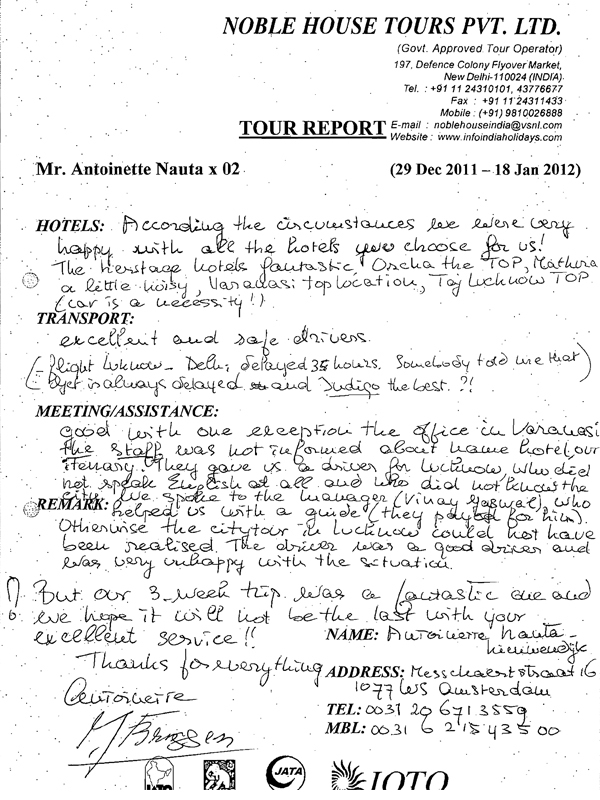 To read complete review please click on the image and get handwritten review by our clients. 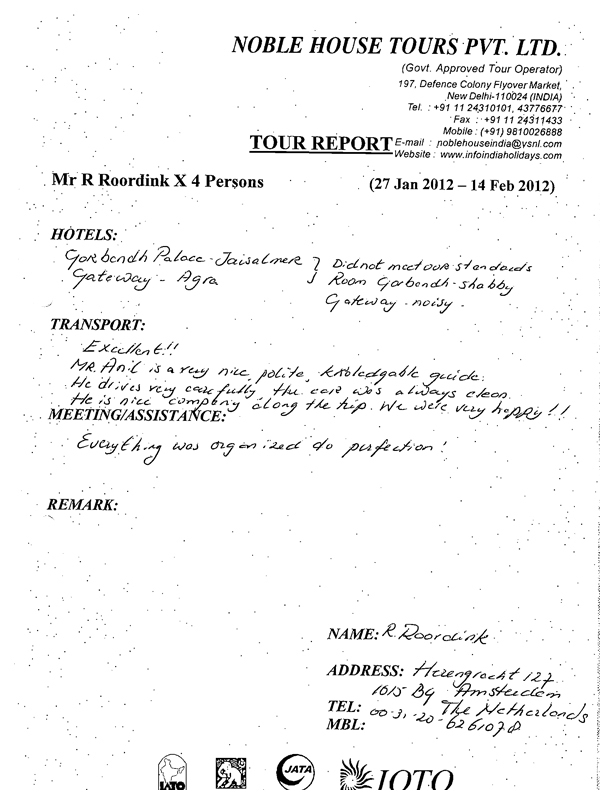 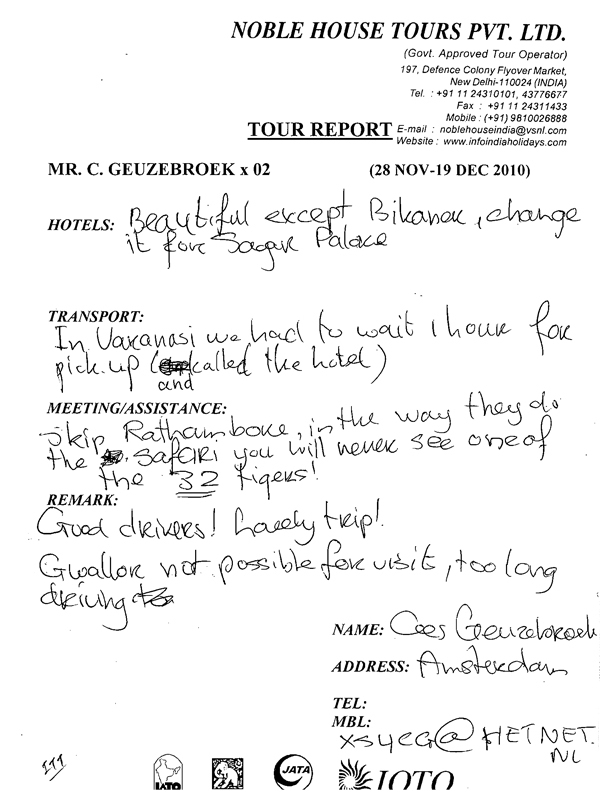 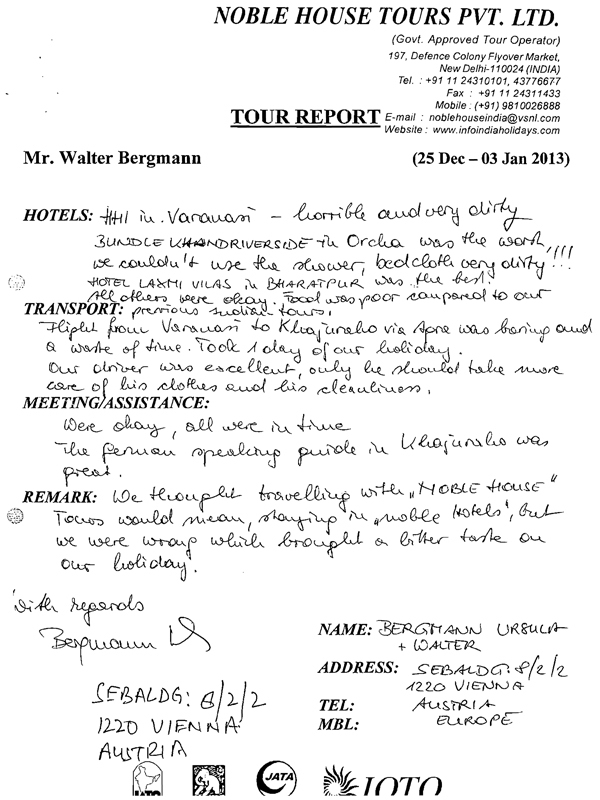 Mr. C. Geuzebroek has given review about our services and hospitality.There view point about transportaion, services, hotels, drivers and guide is described here. 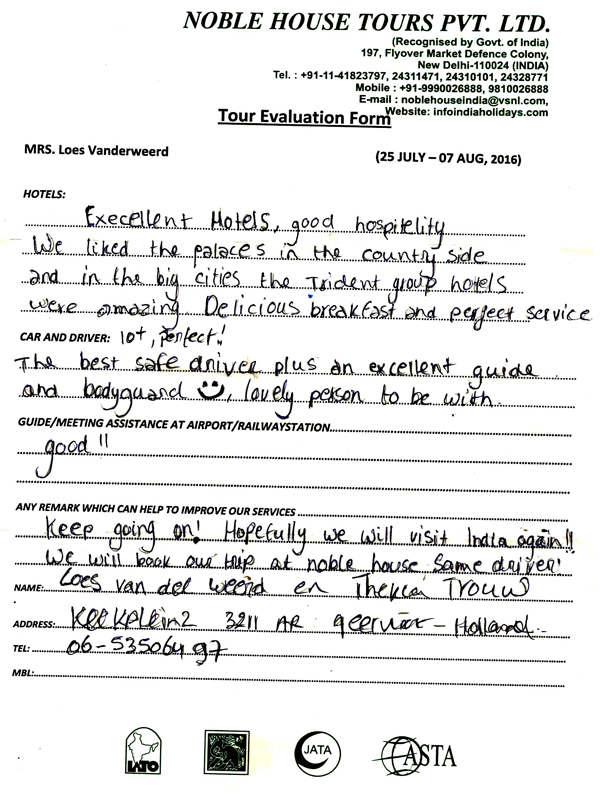 To read complete review please click on the image and get handwritten review by our clients. 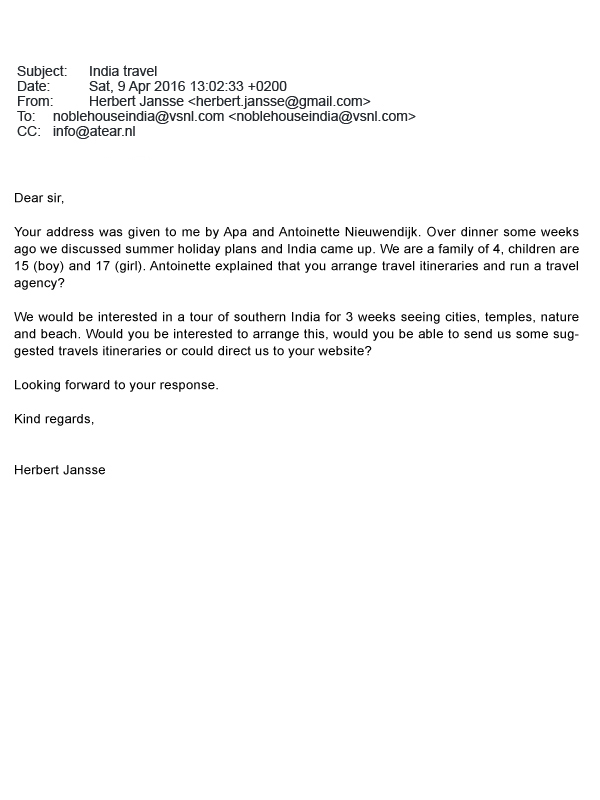 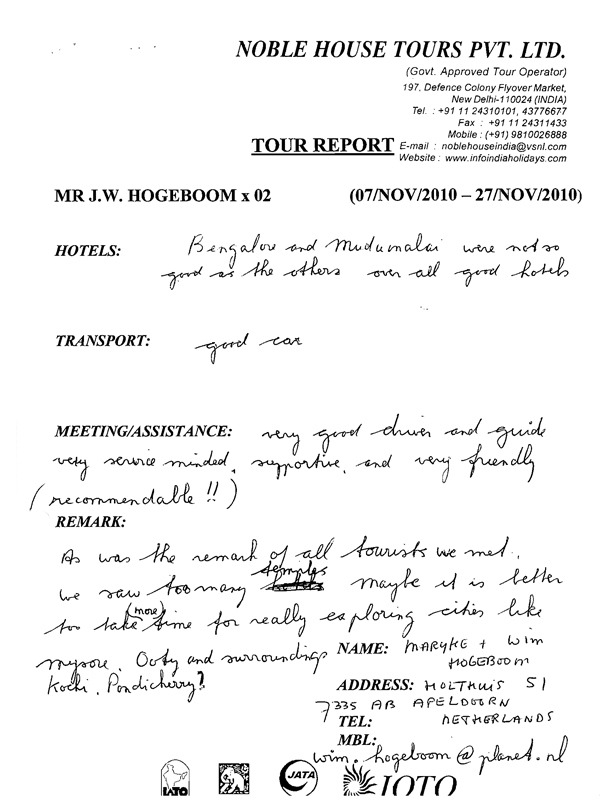 Mr.J.W.Hogeboom has has given review about our services and hospitality.There view point about transportaion, services, hotels, drivers and guide is described here. 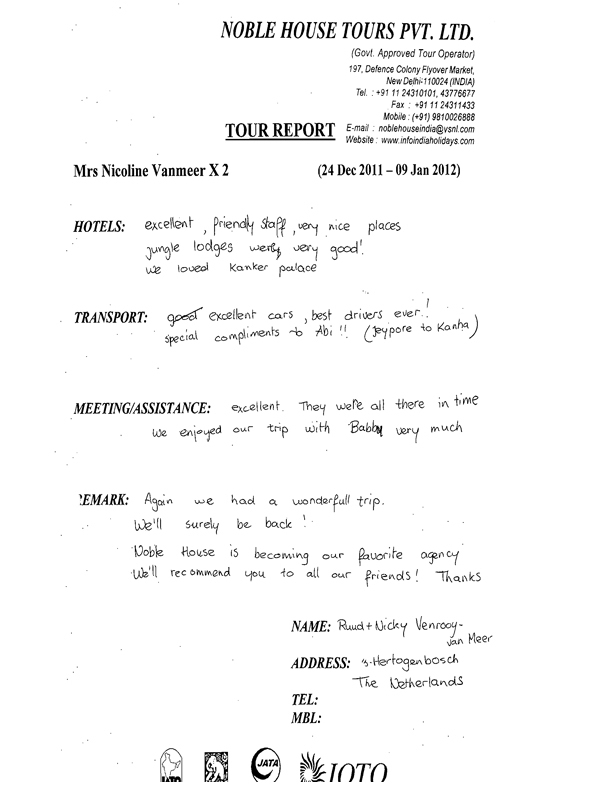 To read complete review please click on the image and get handwritten review by our clients. 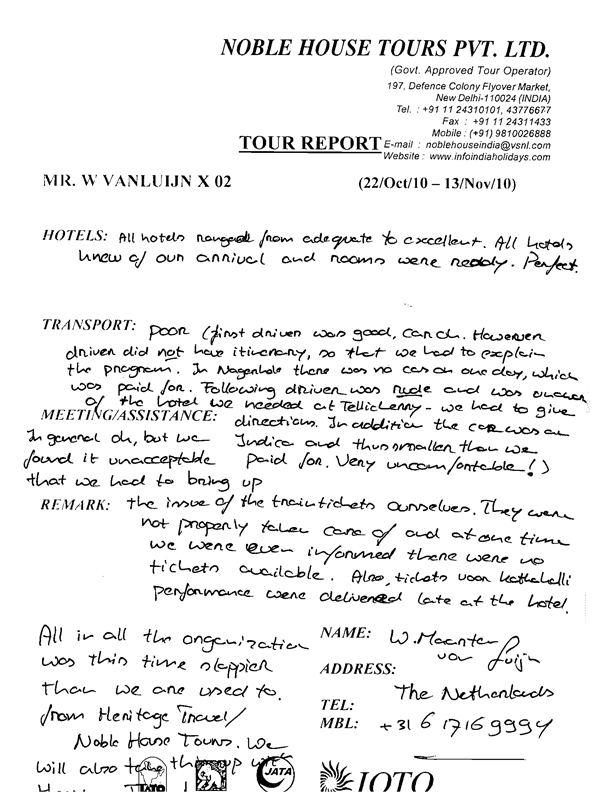 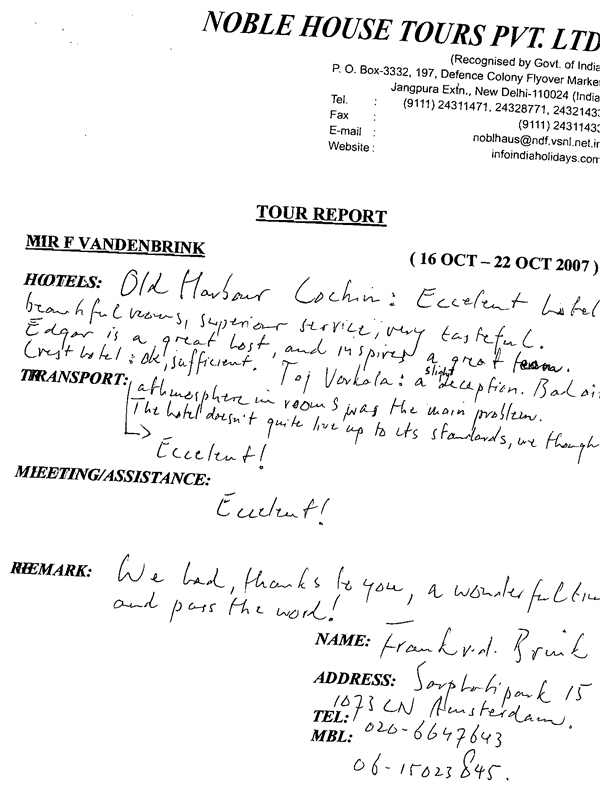 Mr.W Vanluijn has has given review about our services and hospitality.There view point about transportaion, services, hotels, drivers and guide is described here. 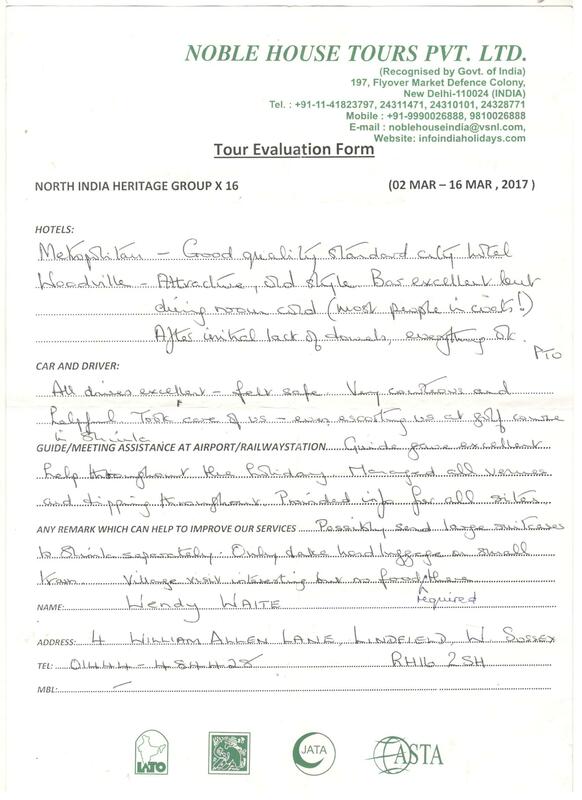 To read complete review please click on the image and get handwritten review by our clients. 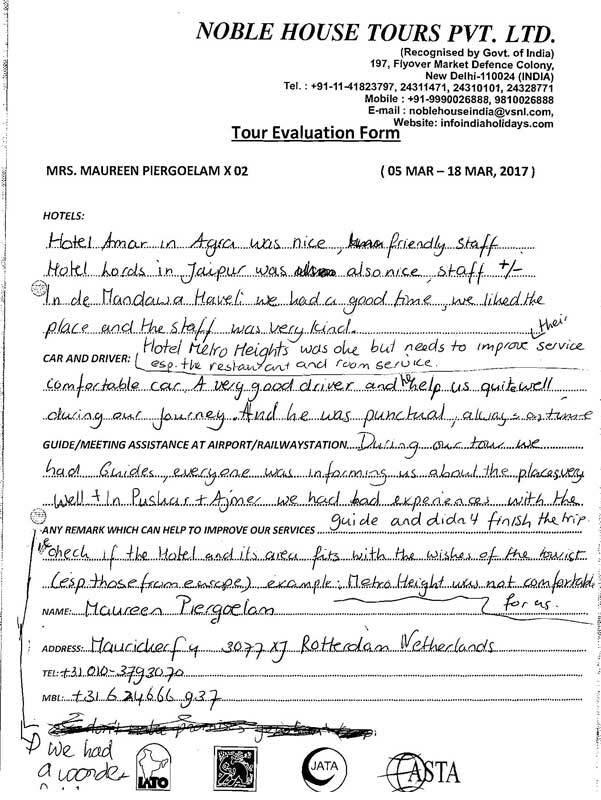 Mrs. E. Moerman has given review about our services and hospitality.There view point about transportaion, services, hotels, drivers and guide is described here. 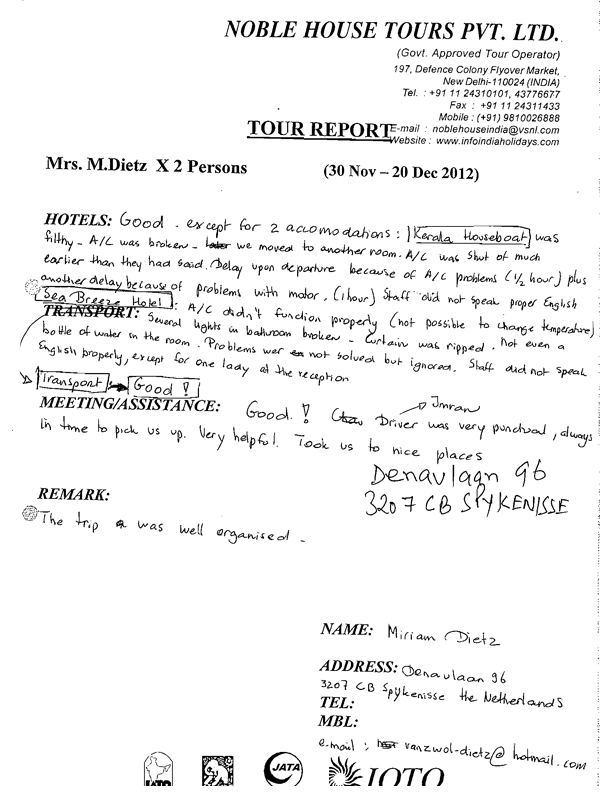 To read complete review please click on the image and get handwritten review by our clients. 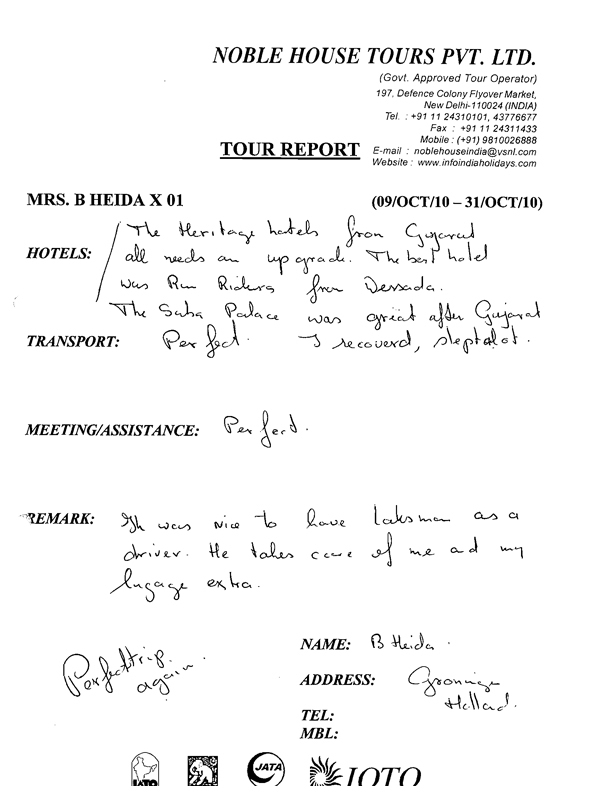 Mrs. B Heida has given review about our services and hospitality.There view point about transportaion, services, hotels, drivers and guide is described here. 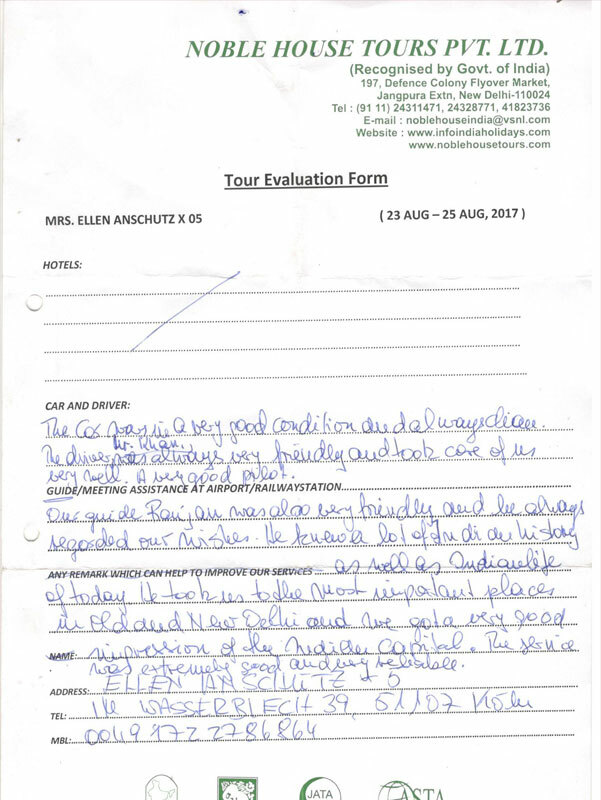 To read complete review please click on the image and get handwritten review by our clients. 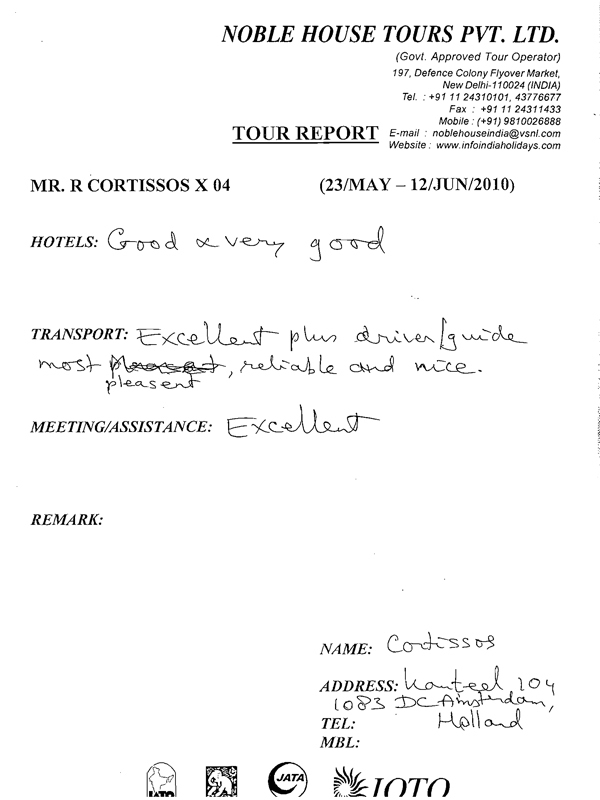 Mr. R Cortissos has given review about our services and hospitality.There view point about transportaion, services, hotels, drivers and guide is described here. 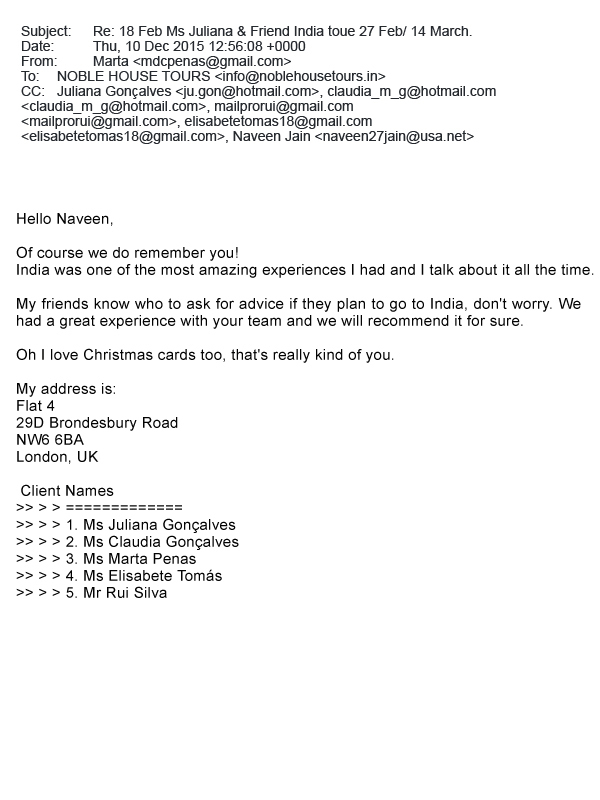 To read complete review please click on the image and get handwritten review by our clients. 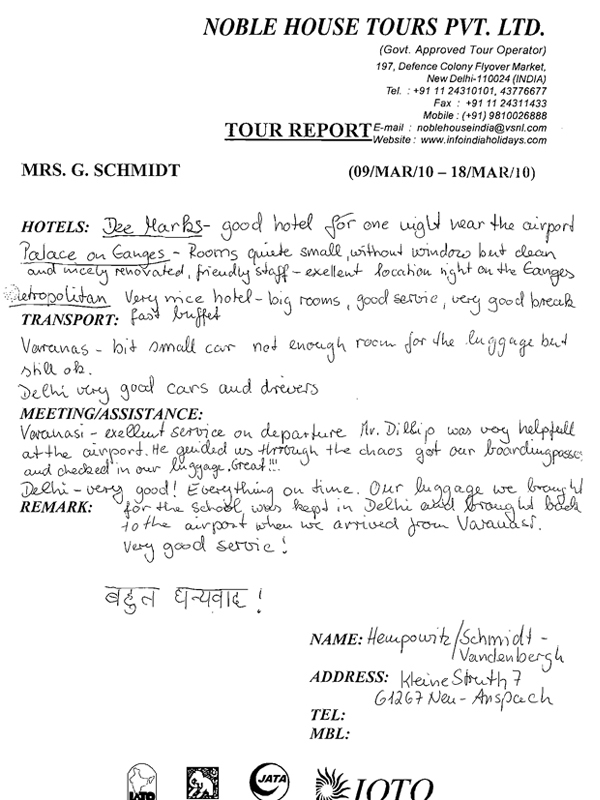 Mrs. Schmid has given review about our services and hospitality.There view point about transportaion, services, hotels, drivers and guide is described here. 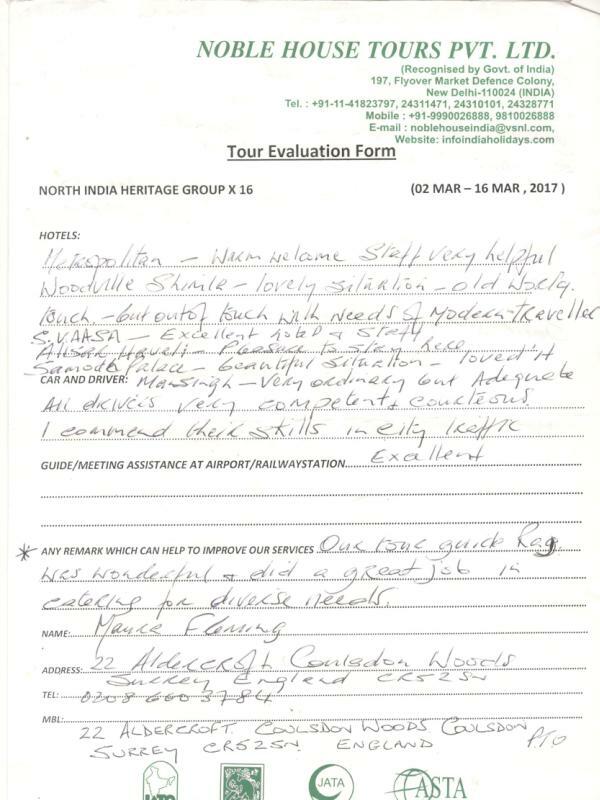 To read complete review please click on the image and get handwritten review by our clients. 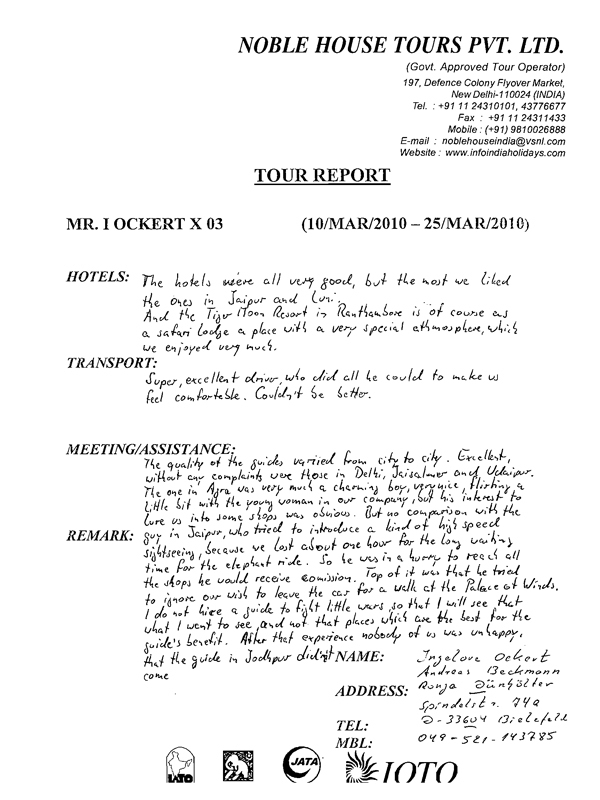 I Ockert has has given review about our services and hospitality.There view point about transportaion, services, hotels, drivers and guide is described here. 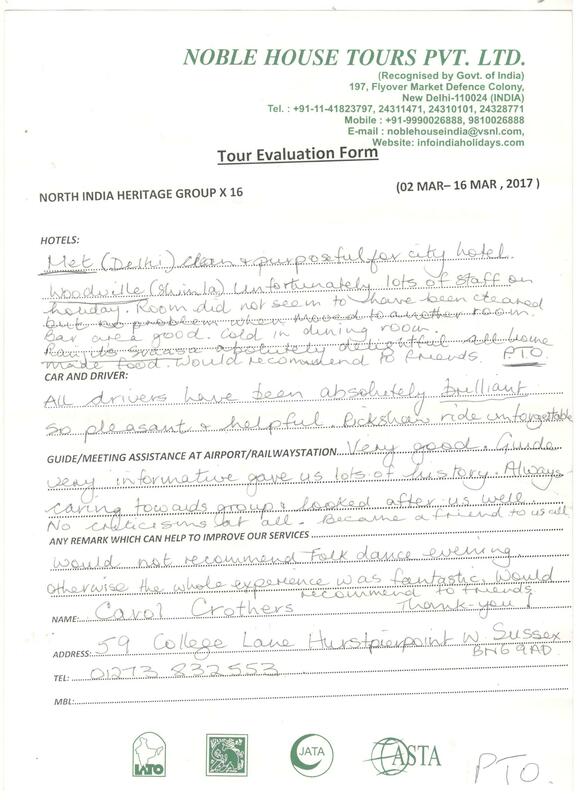 To read complete review please click on the image and get handwritten review by our clients. 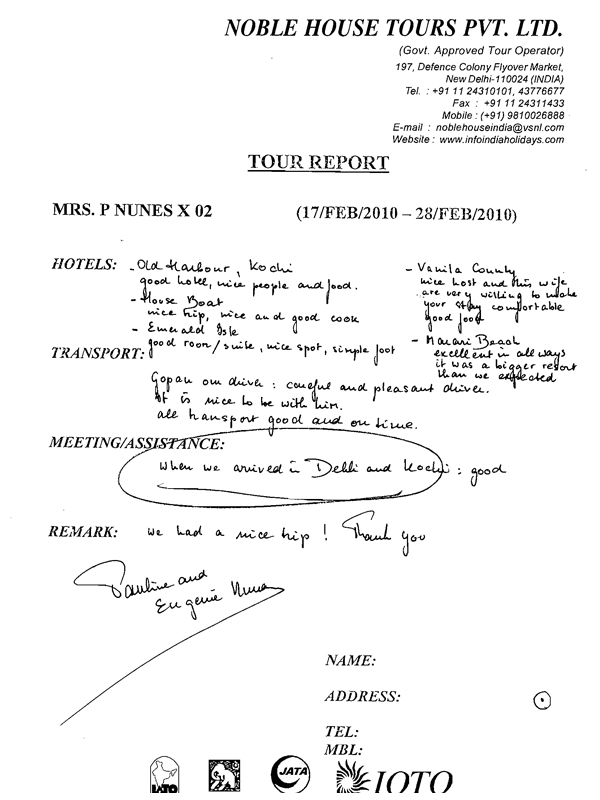 Mrs. P Nunes has has given review about our services and hospitality.There view point about transportaion, services, hotels, drivers and guide is described here. 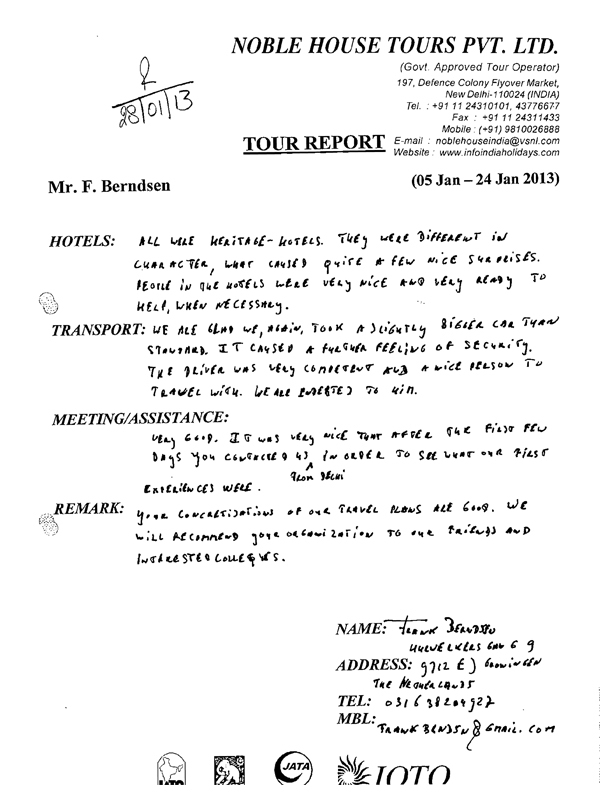 To read complete review please click on the image and get handwritten review by our clients. 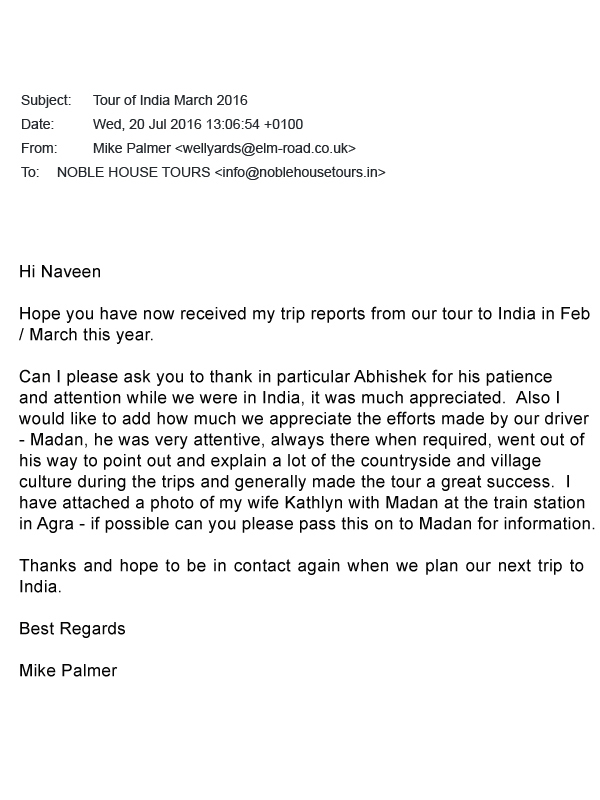 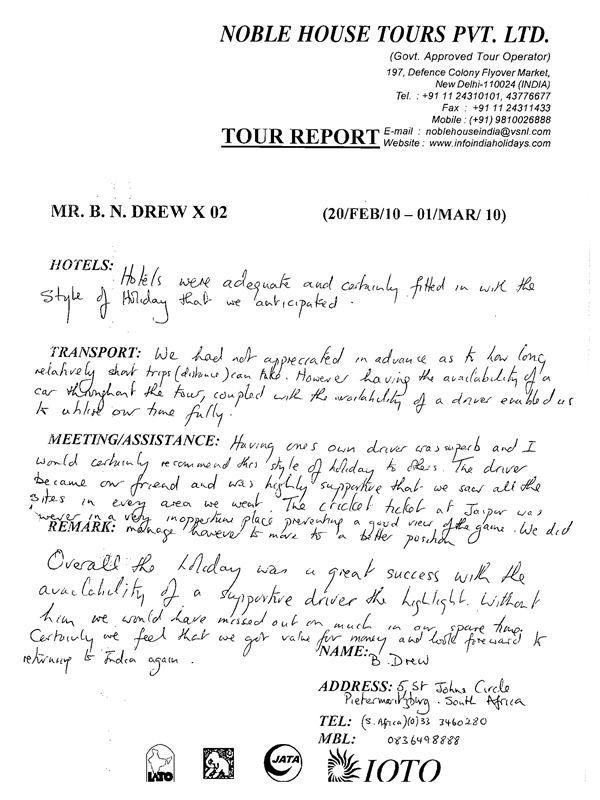 Mr. B.N.Drew has given review about our services and hospitality.There view point about transportaion, services, hotels, drivers and guide is described here. 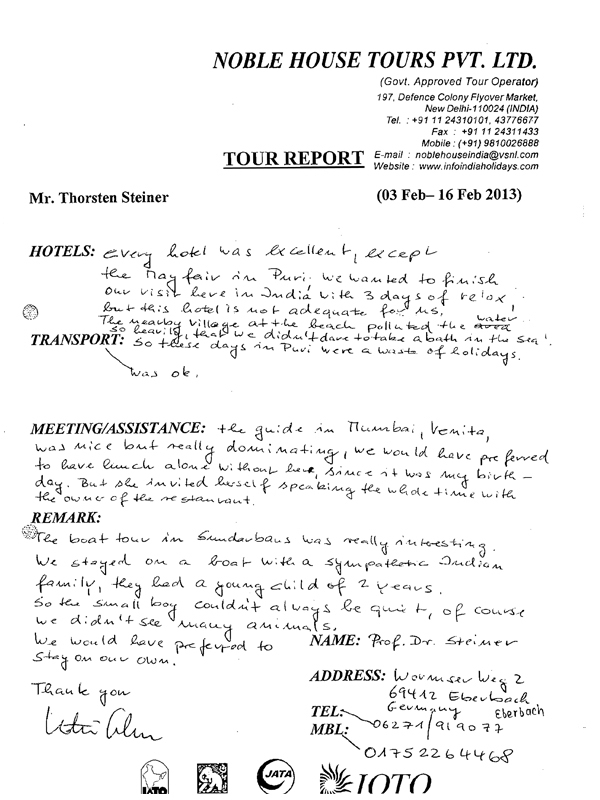 To read complete review please click on the image and get handwritten review by our clients. 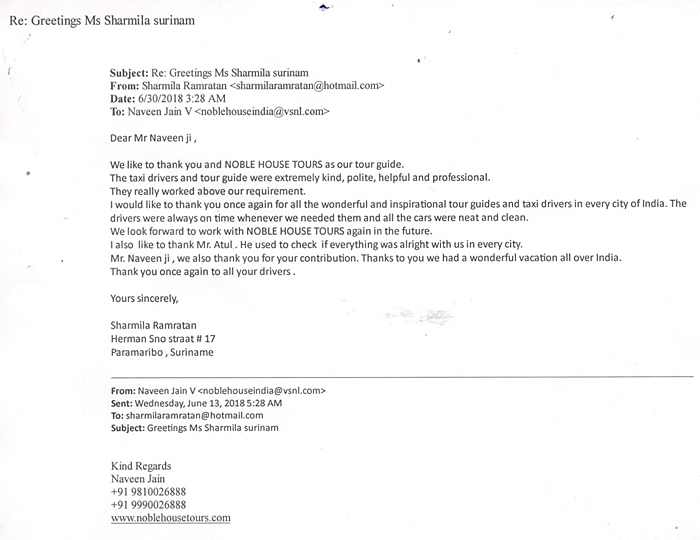 Mrs.Ram Reddy has given review about our services and hospitality.There view point about transportaion, services, hotels, drivers and guide is described here. 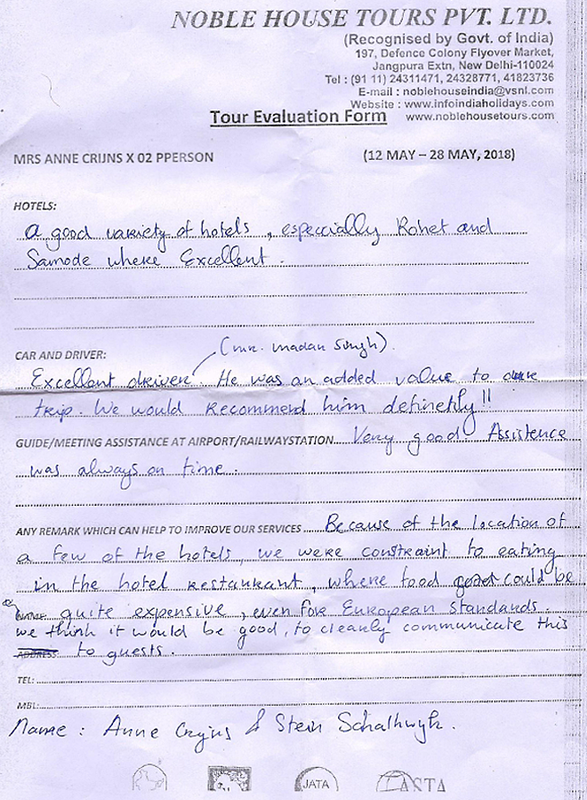 To read complete review please click on the image and get handwritten review by our clients. 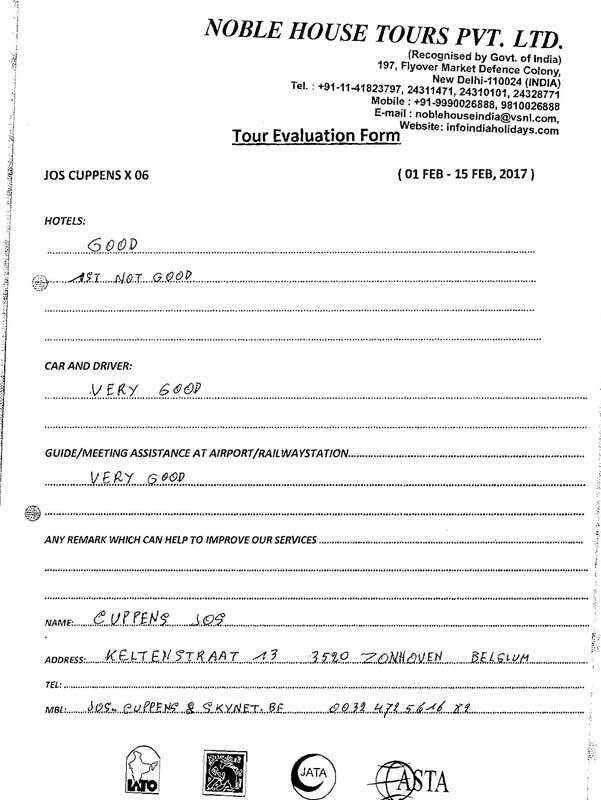 Mr. Johan Fogal has given review about our services and hospitality.There view point about transportaion, services, hotels, drivers and guide is described here. 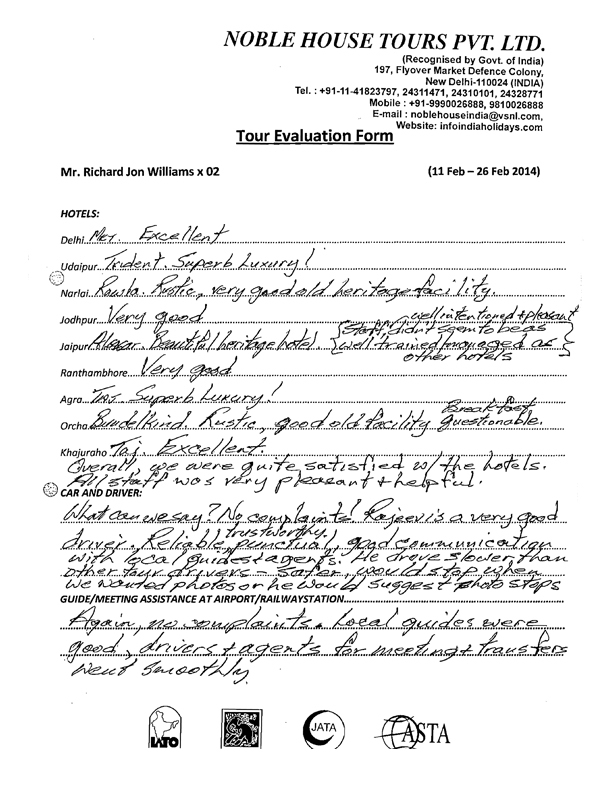 To read complete review please click on the image and get handwritten review by our clients. 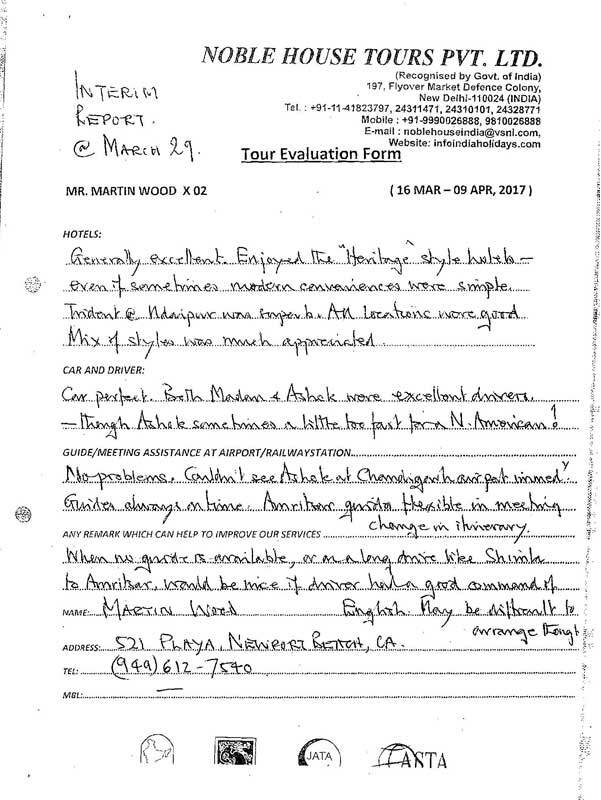 Mr. Martin Seepersad has given review about our services and hospitality.There view point about transportaion, services, hotels, drivers and guide is described here. 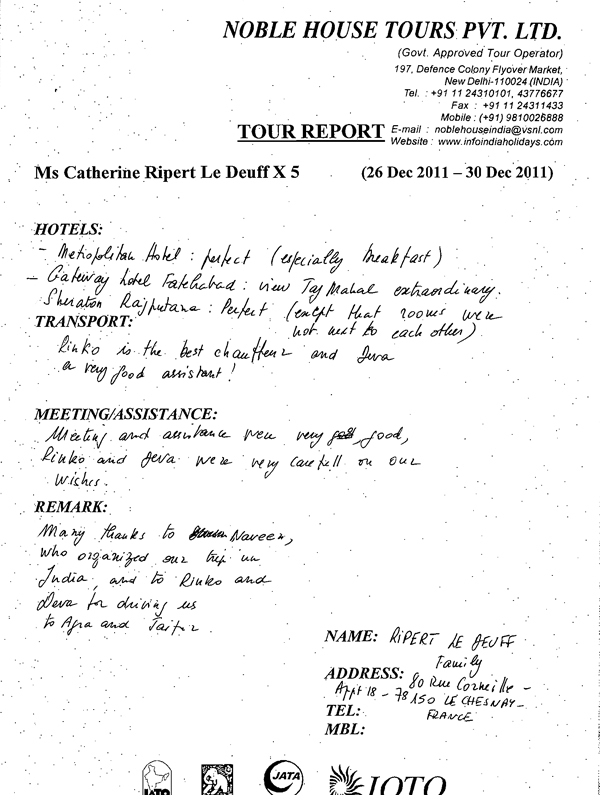 To read complete review please click on the image and get handwritten review by our clients. 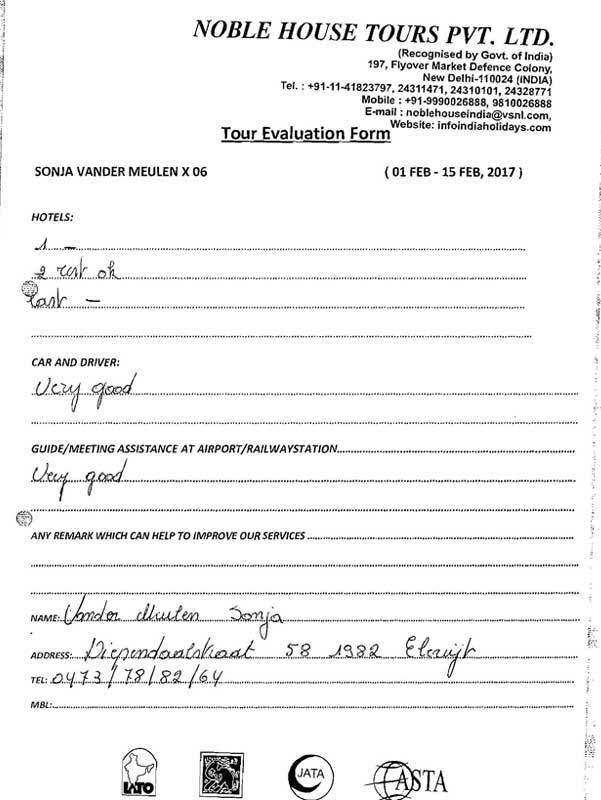 Mrs.Zohra Bibi Vassen has has given review about our services and hospitality.There view point about transportaion, services, hotels, drivers and guide is described here. 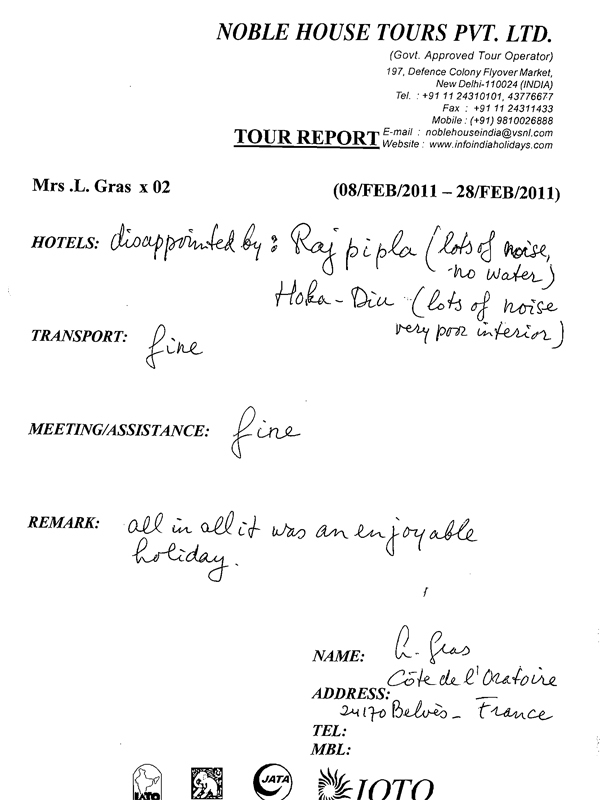 To read complete review please click on the image and get handwritten review by our clients. 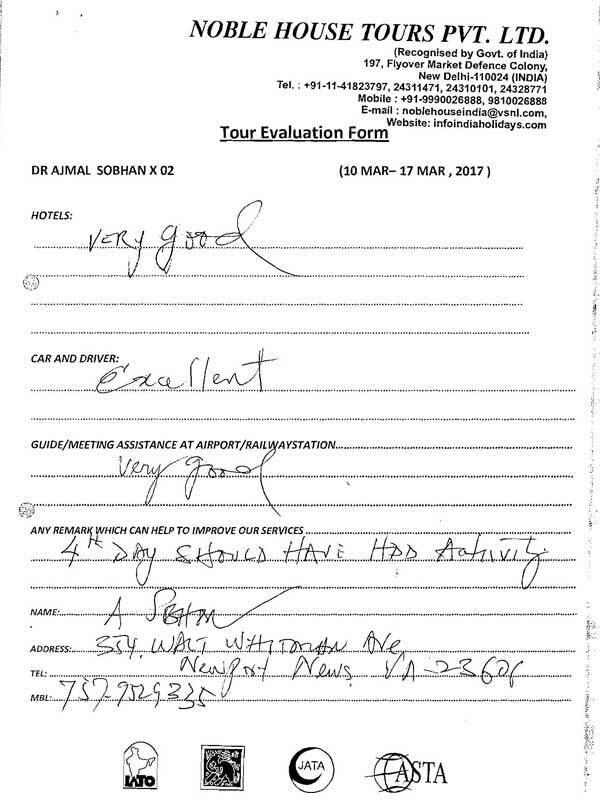 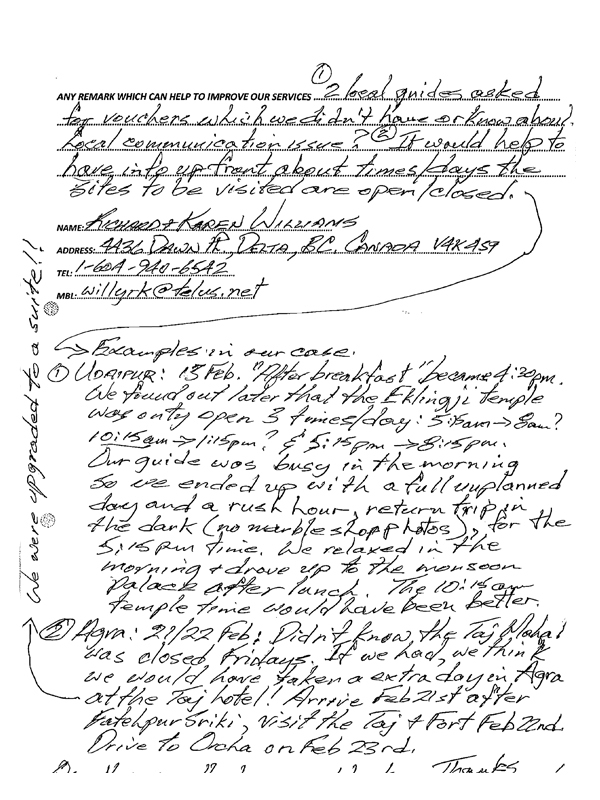 handwritten review by our clients. 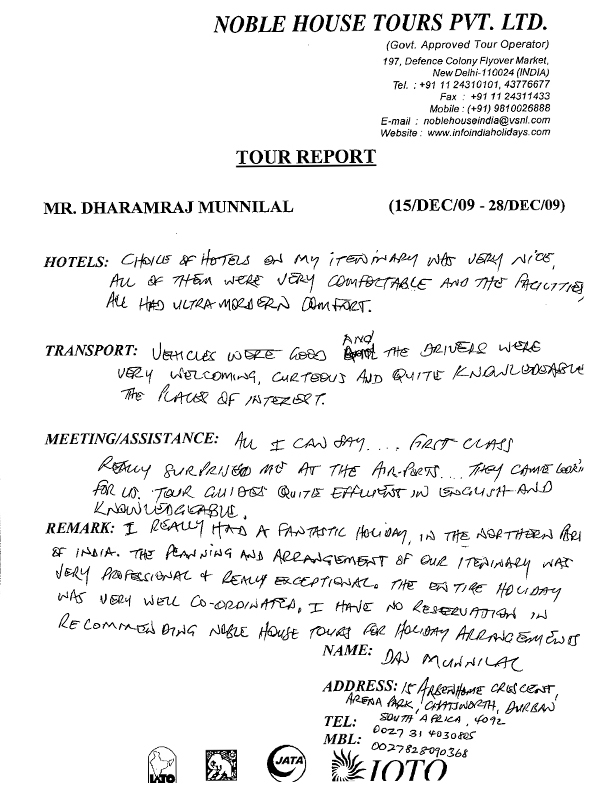 Mr. Dharamraj Munnilal has given review about our services and hospitality.There view point about transportaion, services, hotels, drivers and guide is described here. 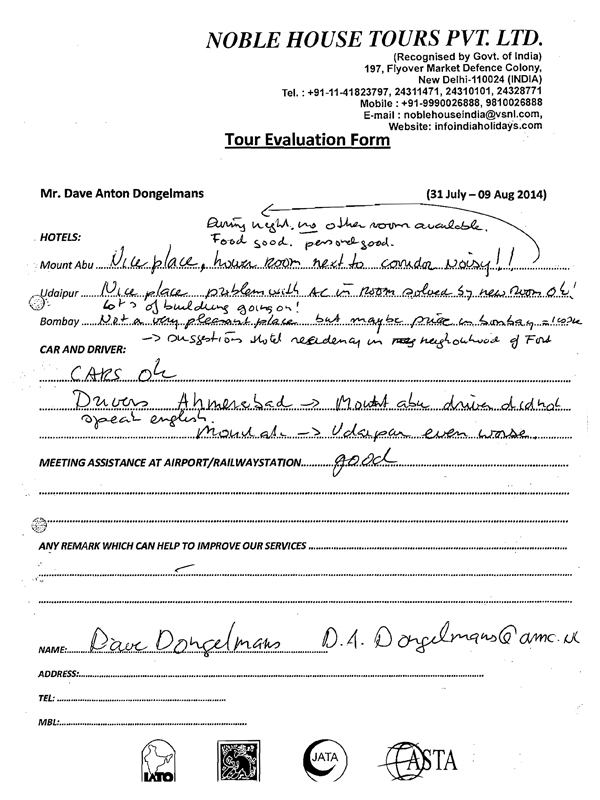 To read complete review please click on the image and get handwritten review by our clients. 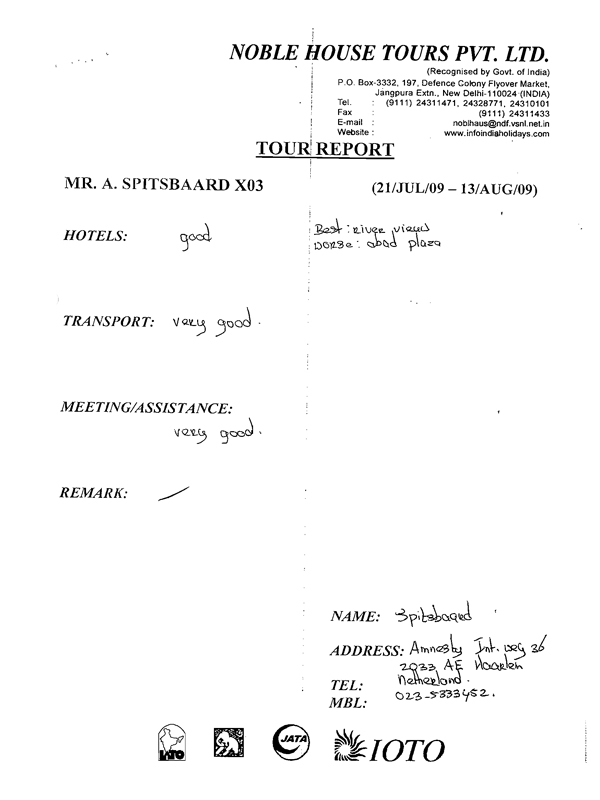 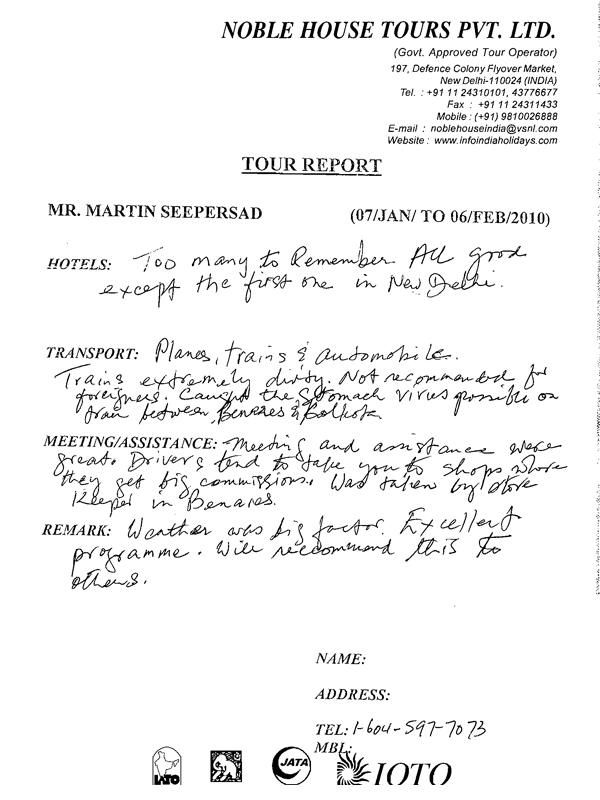 Mr. A Spitsbaard has given review about our services and hospitality.There view point about transportaion, services, hotels, drivers and guide is described here. 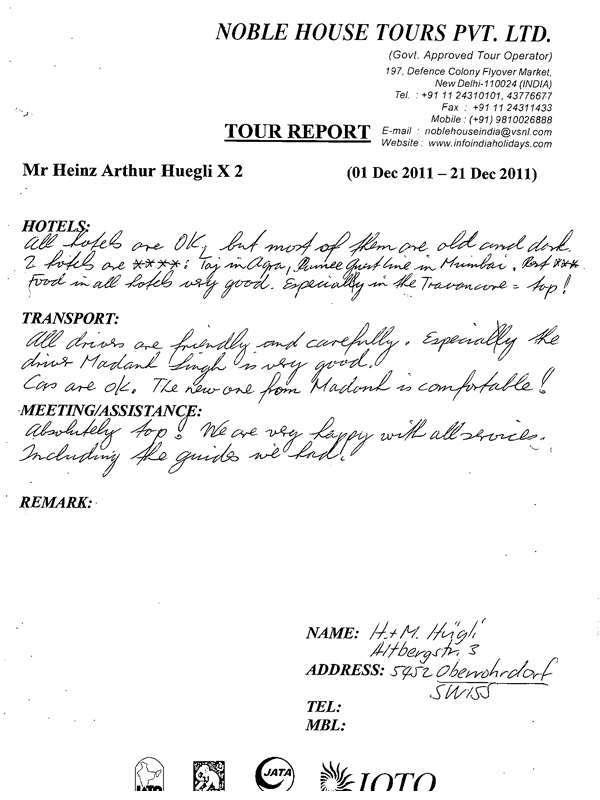 To read complete review please click on the image and get handwritten review by our clients. 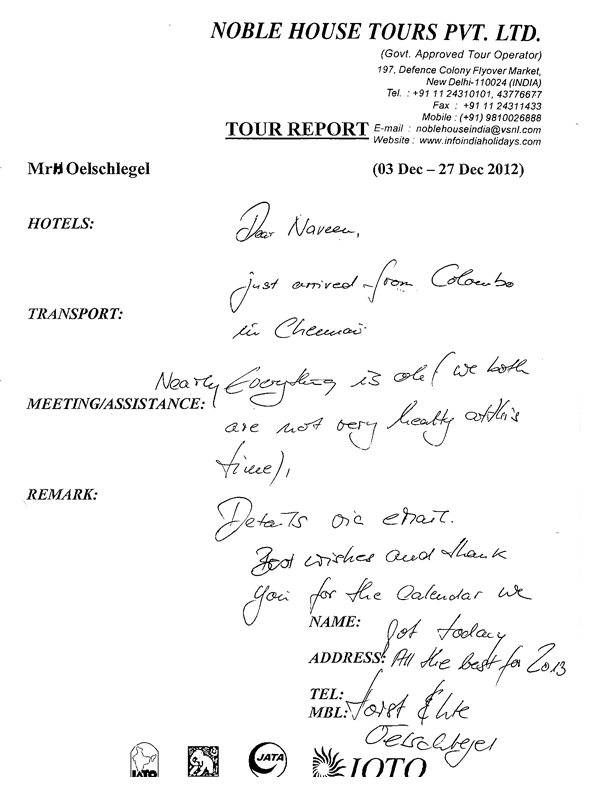 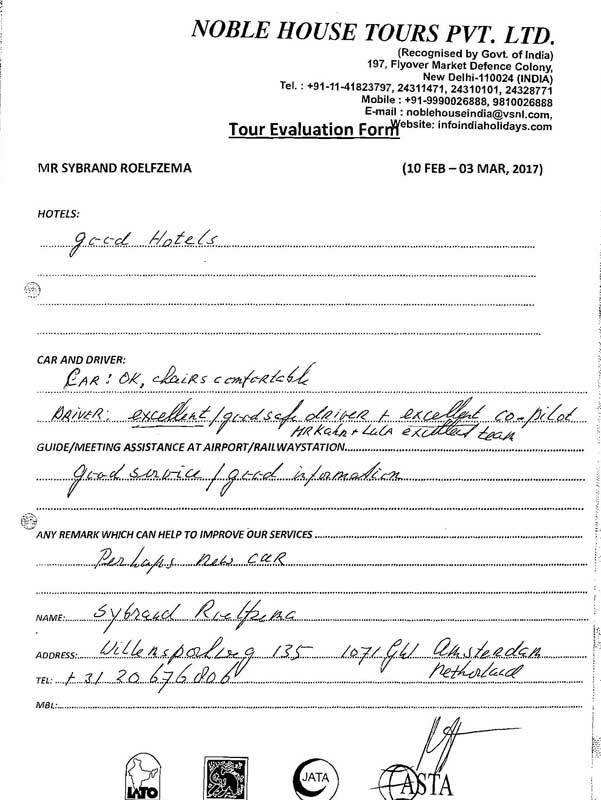 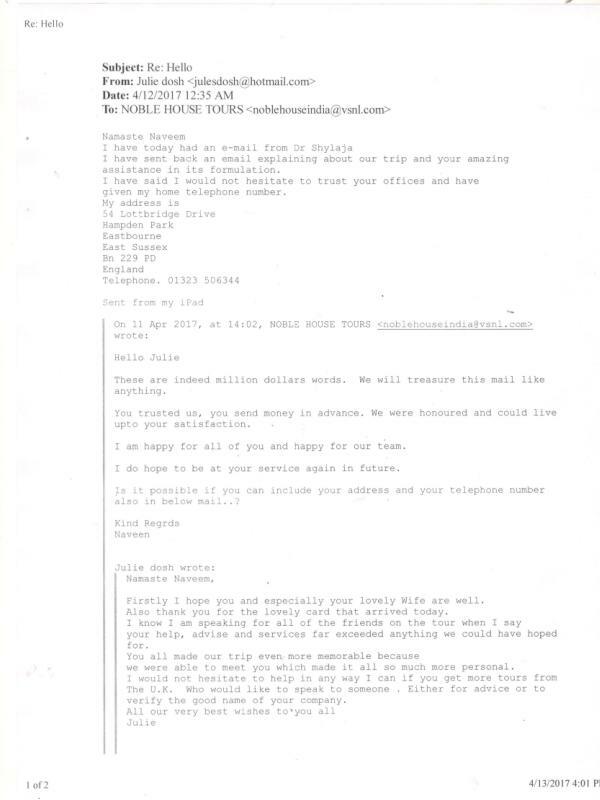 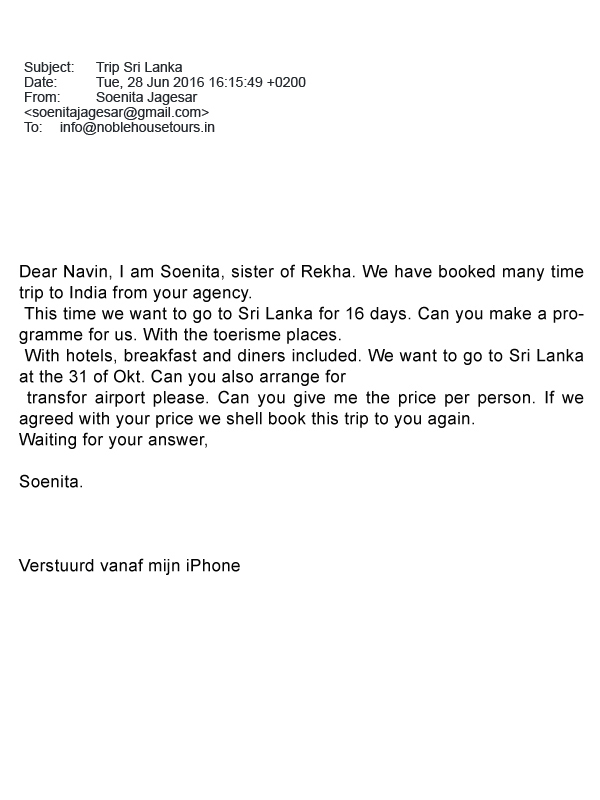 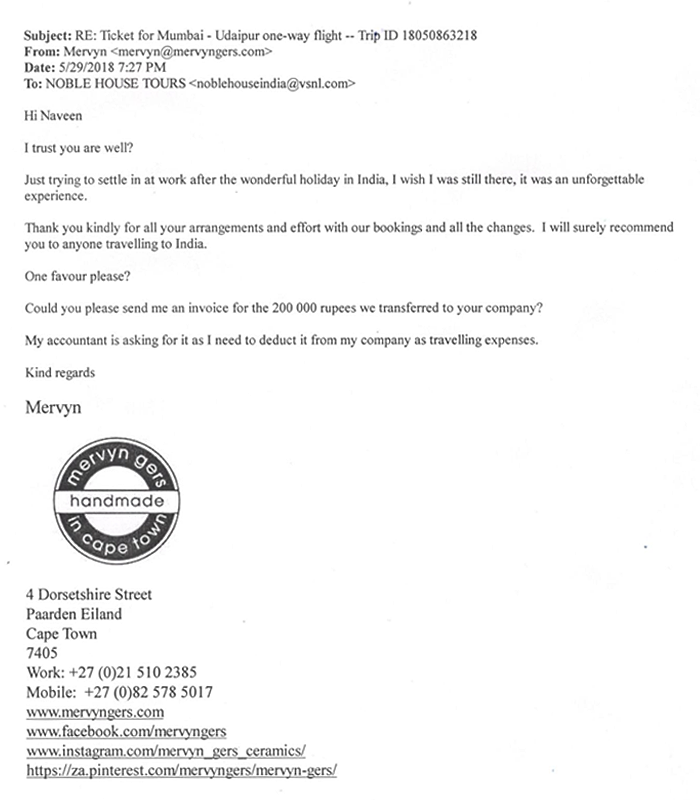 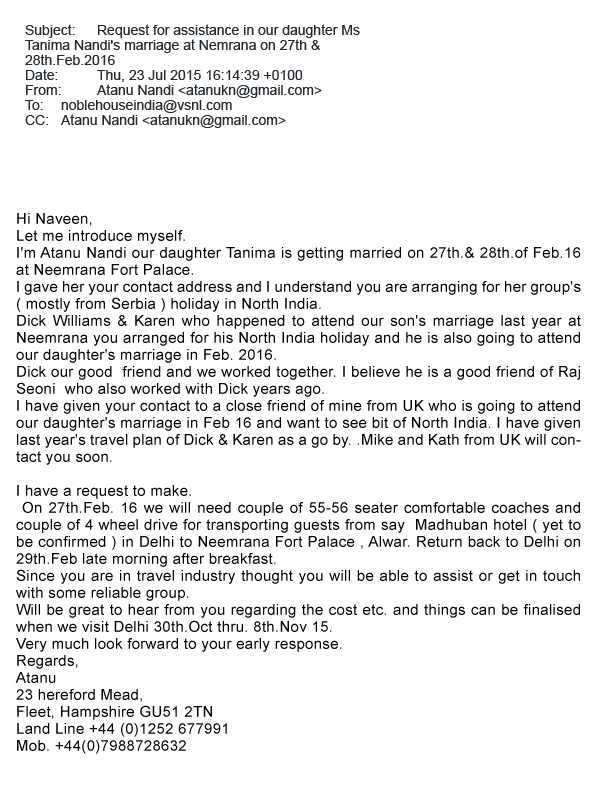 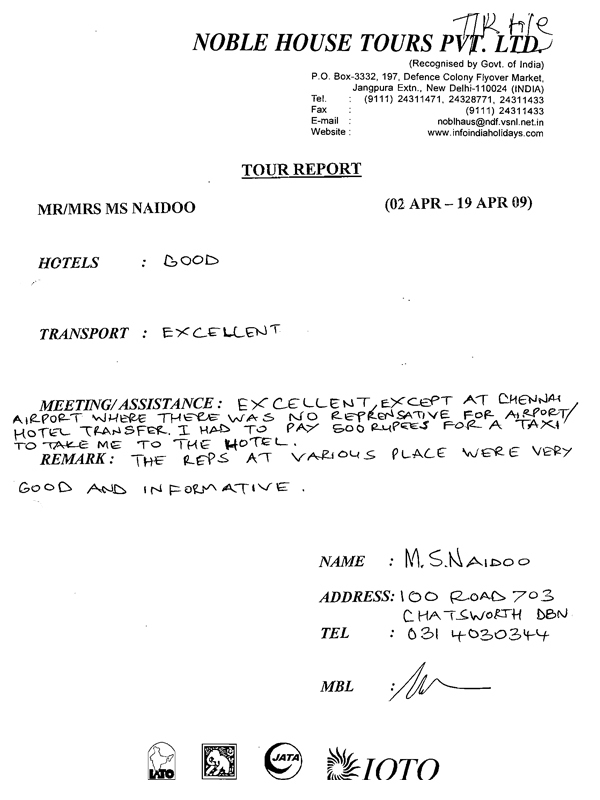 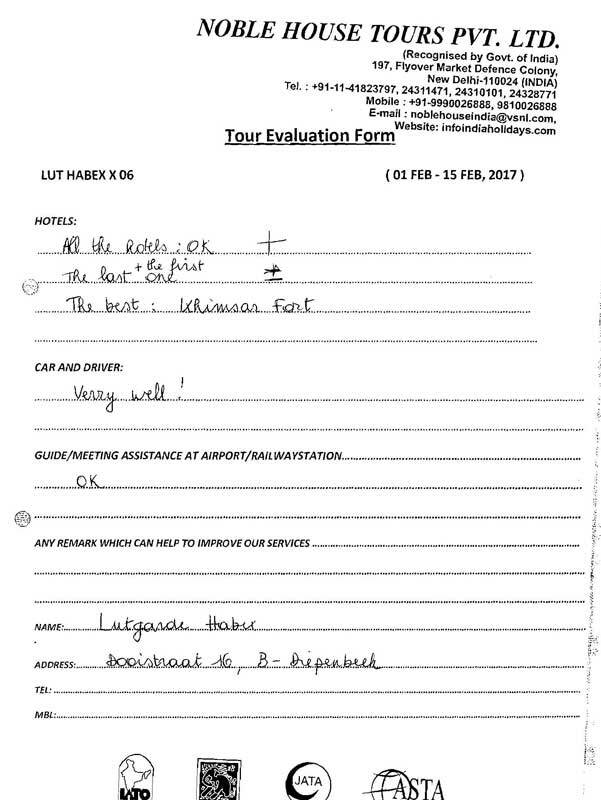 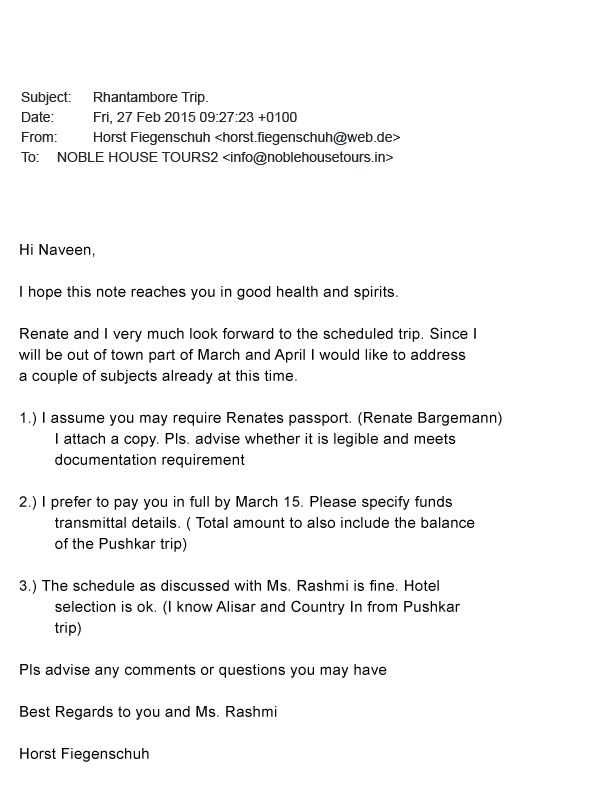 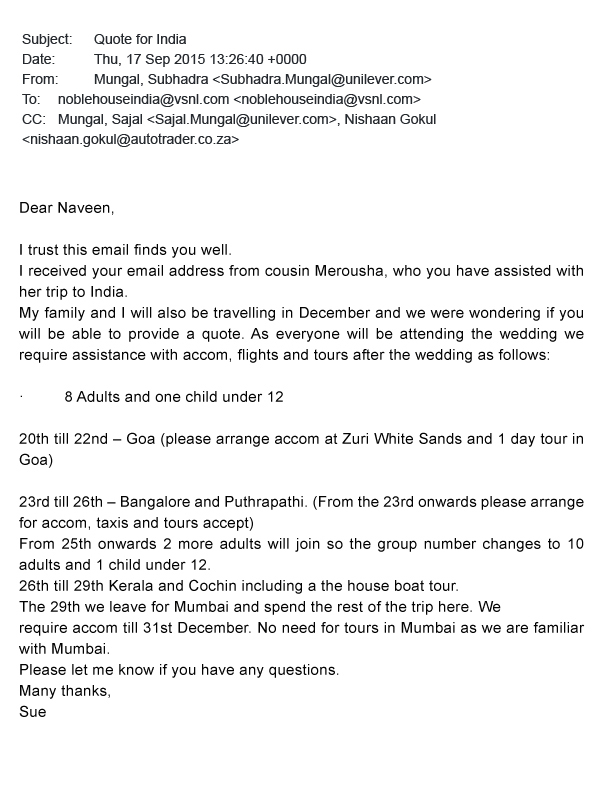 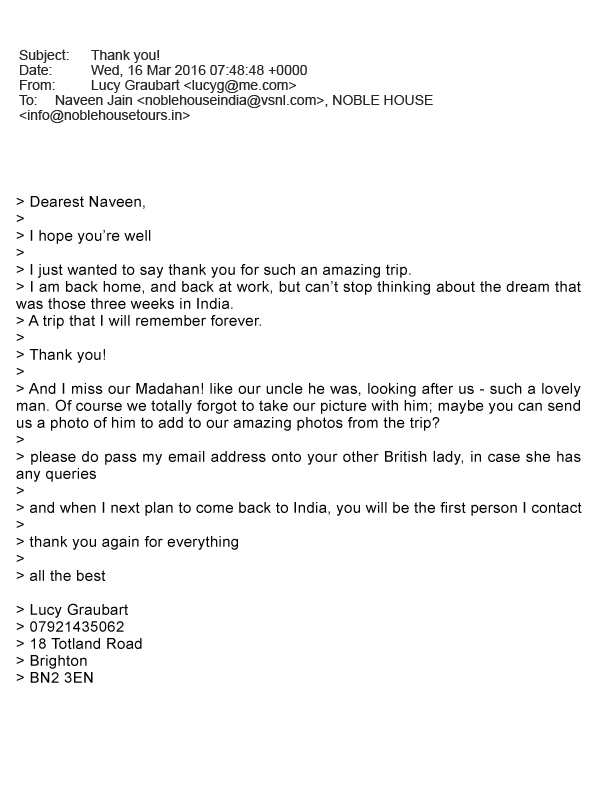 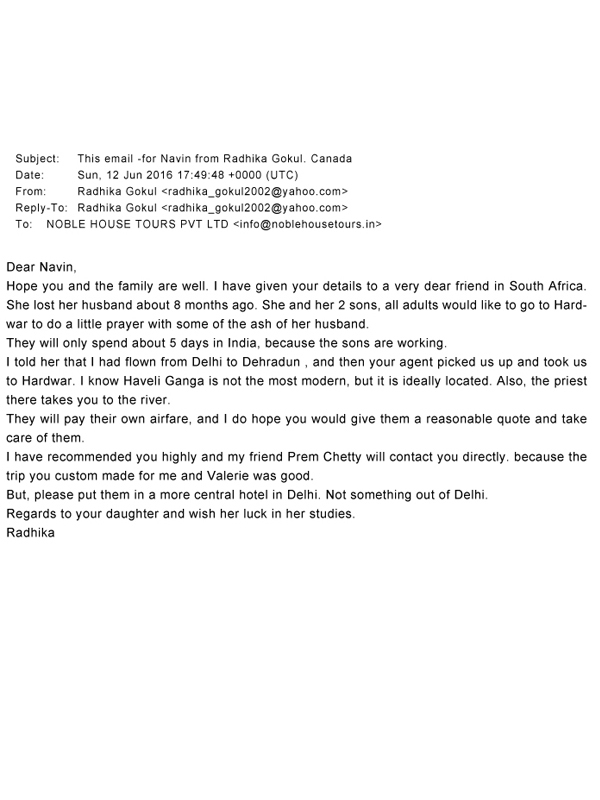 Mrs MS Naidoo has has given review about our services and hospitality.There view point about transportaion, services, hotels, drivers and guide is described here. 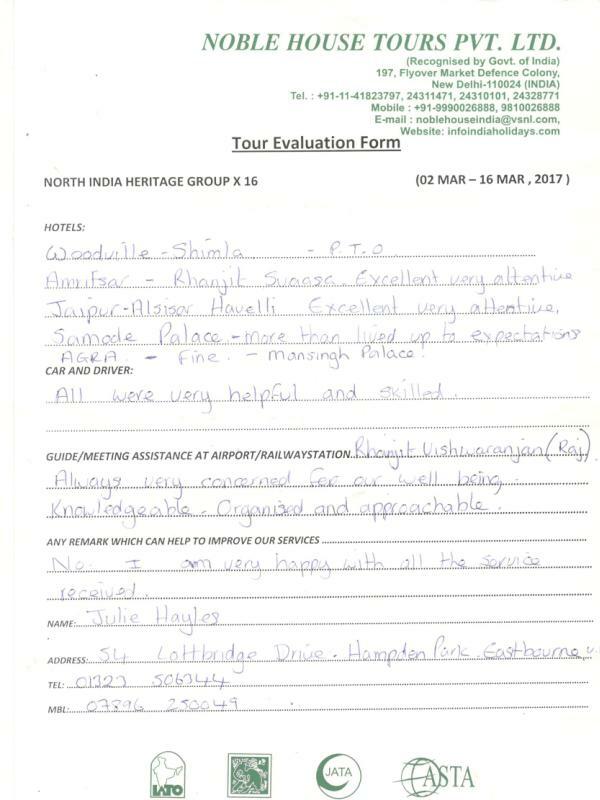 To read complete review please click on the image and get handwritten review by our clients. 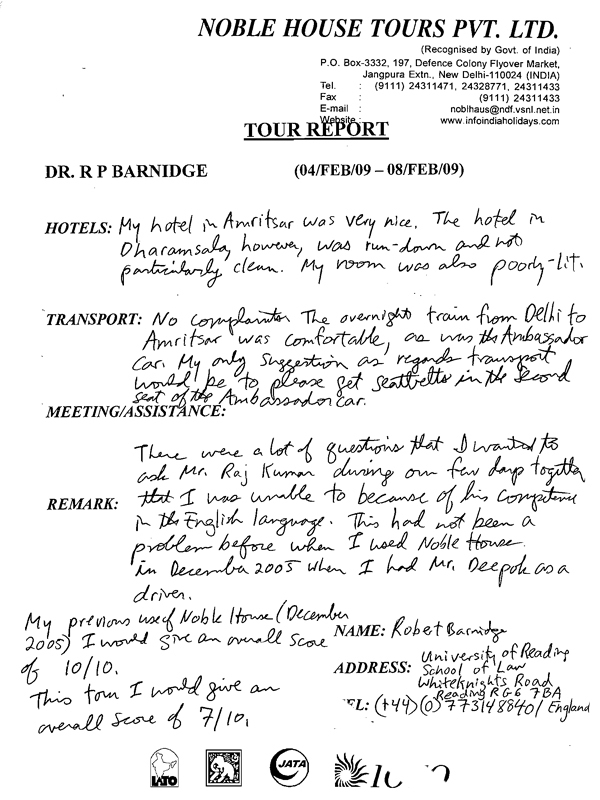 Dr. RP Barnidge has given review about our services and hospitality.There view point about transportaion, services, hotels, drivers and guide is described here. 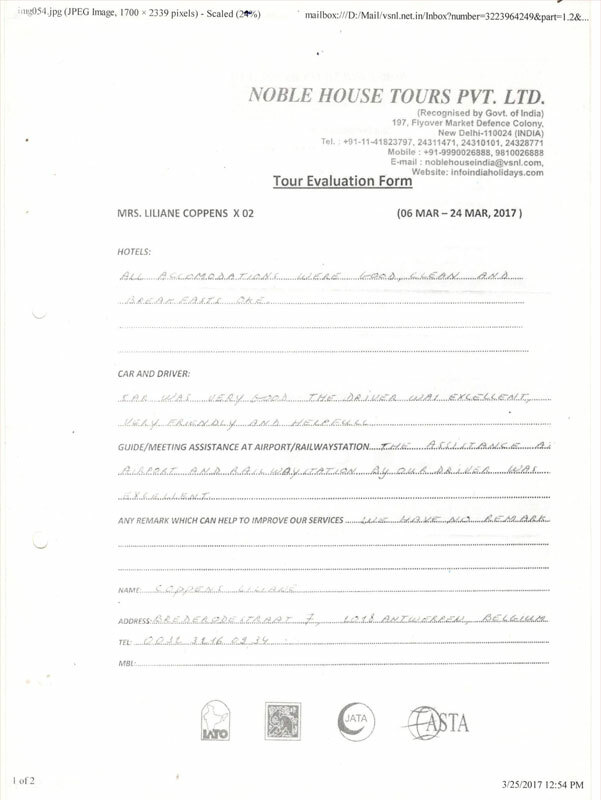 To read complete review please click on the image and get handwritten review by our clients. 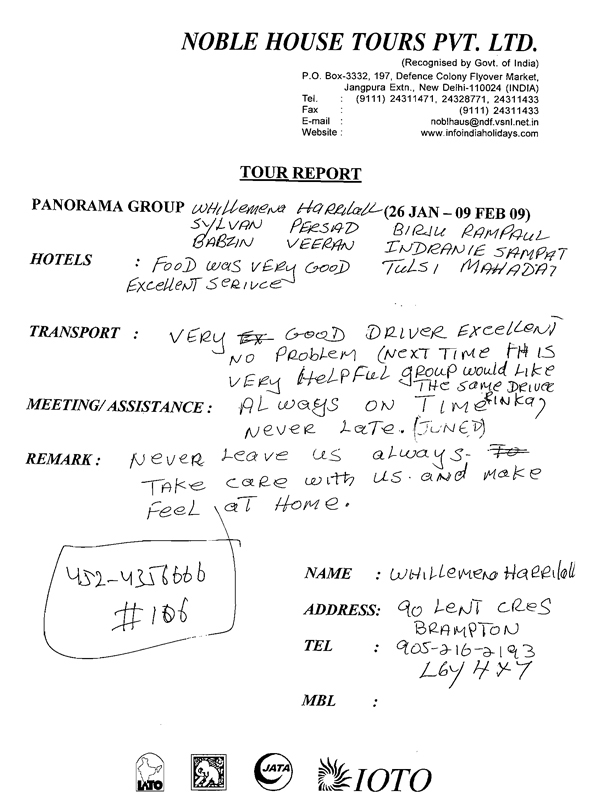 Panorama Group has given review about our services and hospitality.There view point about transportaion, services, hotels, drivers and guide is described here. 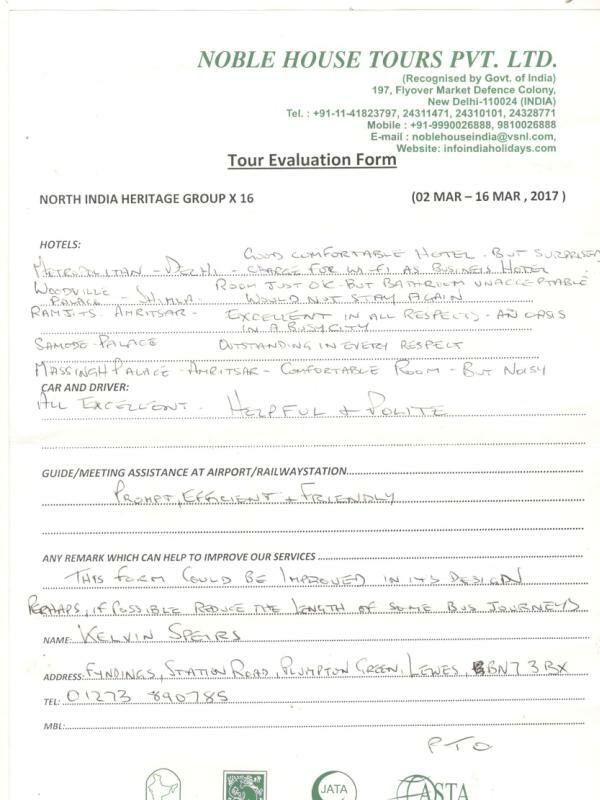 To read complete review please click on the image and get handwritten review by our clients. 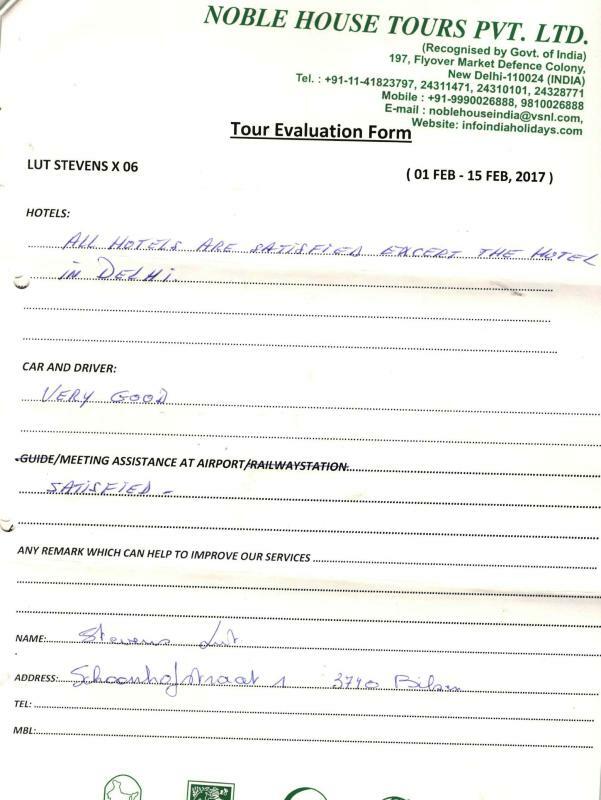 Mr D Harshunkar has given review about our services and hospitality.There view point about transportaion, services, hotels, drivers and guide is described here. 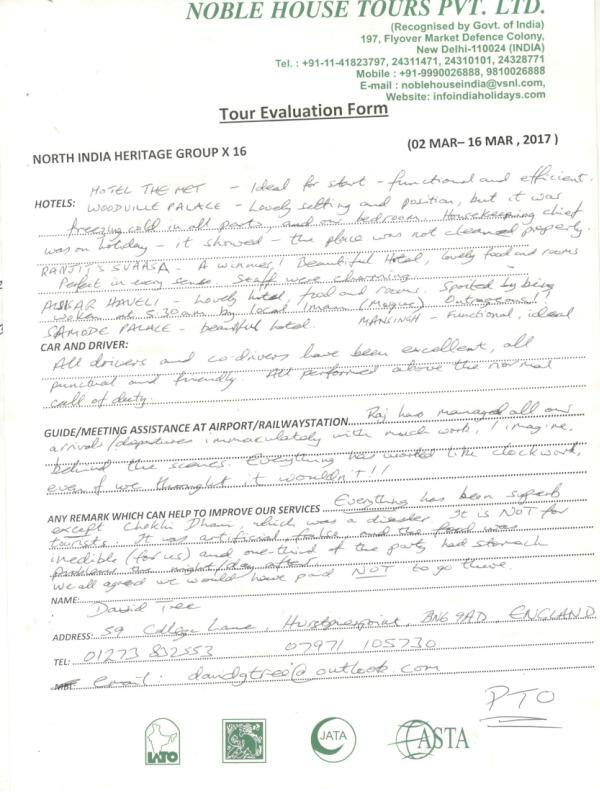 To read complete review please click on the image and get handwritten review by our clients. 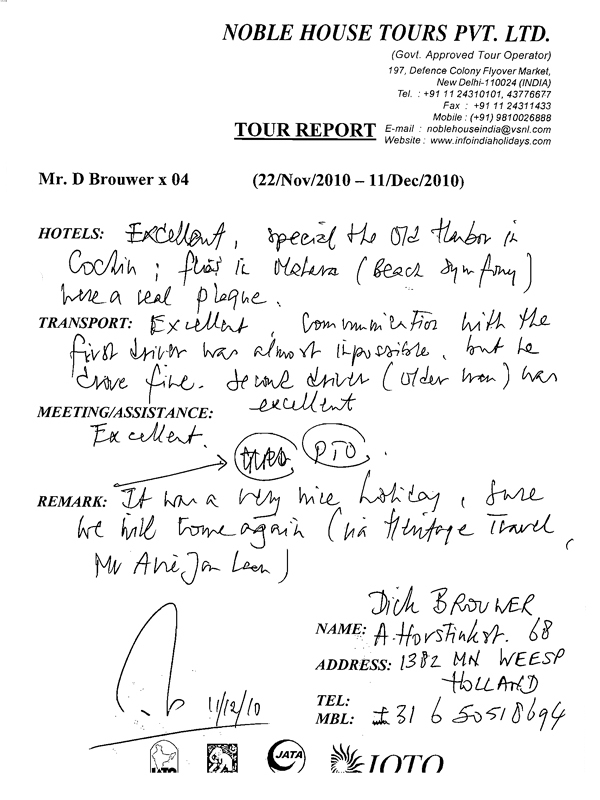 Mr D Brouwer has given review about our services and hospitality.There view point about transportaion, services, hotels, drivers and guide is described here. 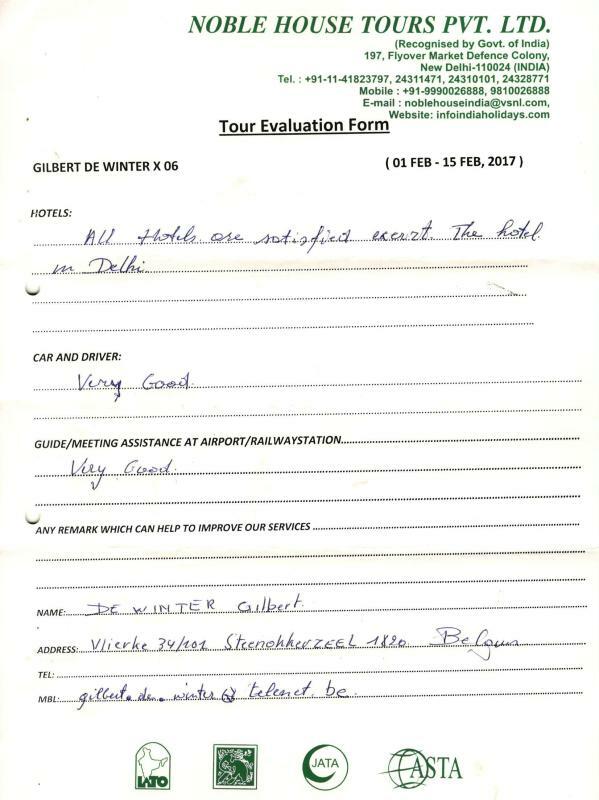 To read complete review please click on the image and get handwritten review by our clients. 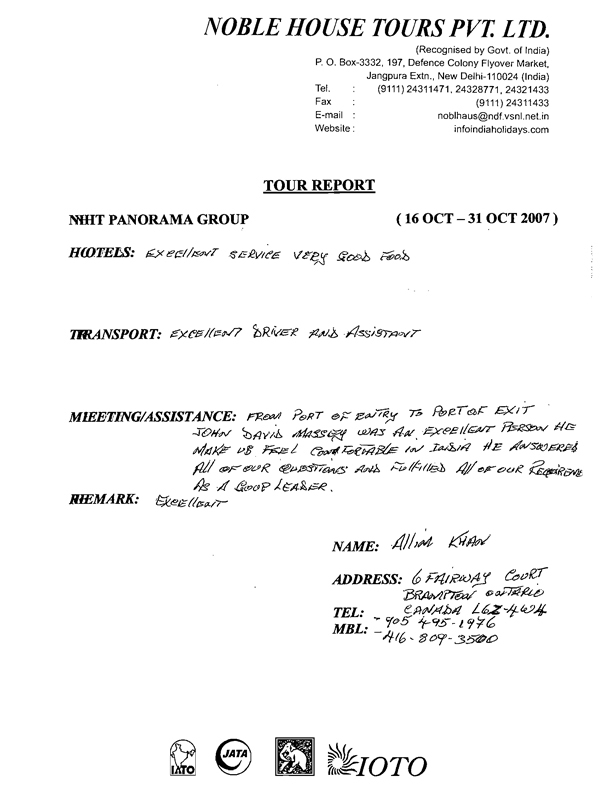 NIHT Panorama Group has given review about our services and hospitality.There view point about transportaion, services, hotels, drivers and guide is described here. 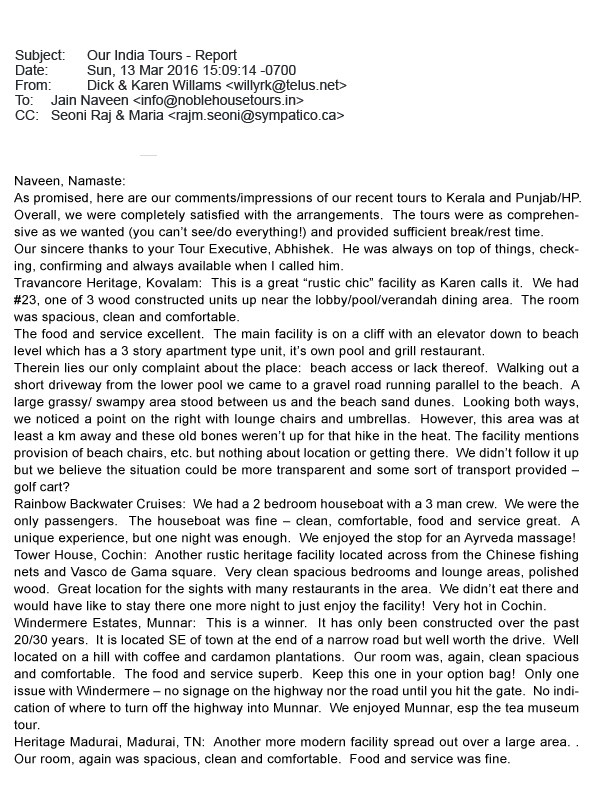 To read complete review please click on the image and get handwritten review by our clients. 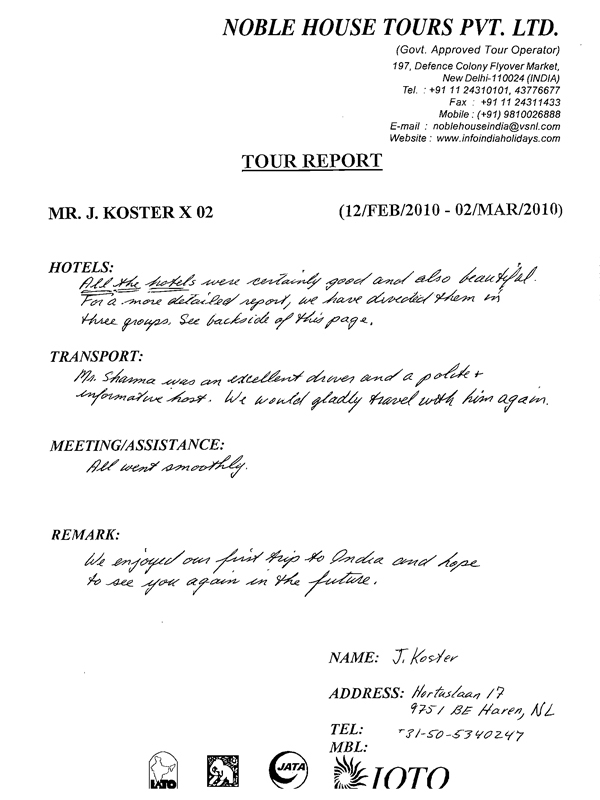 Mir F Vandenbrink has given review about our services and hospitality.There view point about transportaion, services, hotels, drivers and guide is described here. 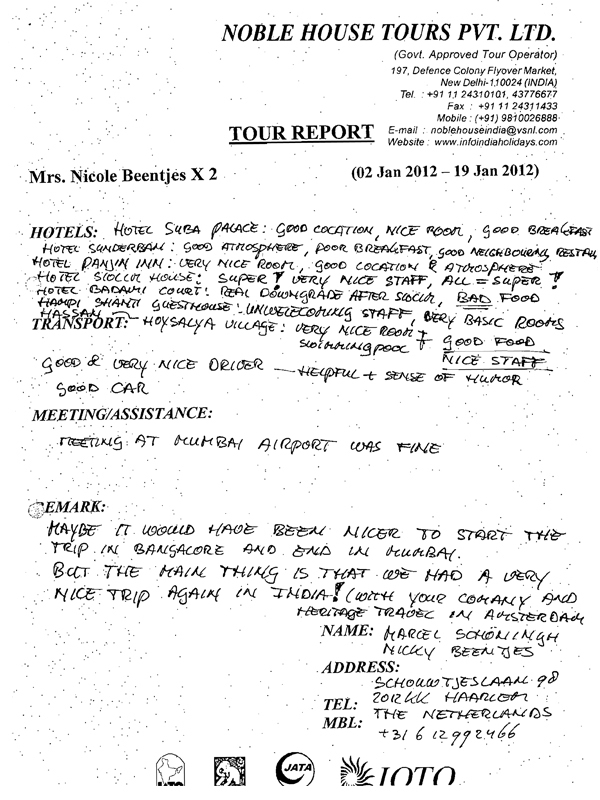 To read complete review please click on the image and get handwritten review by our clients. 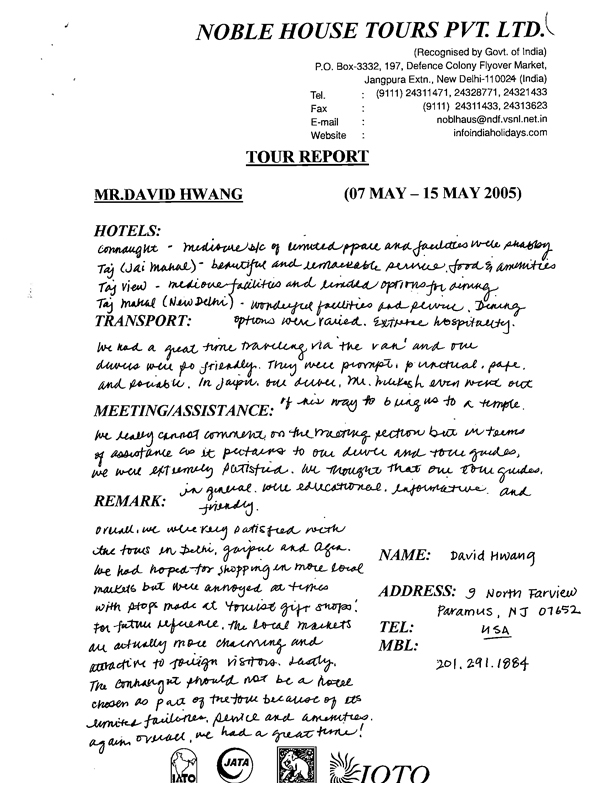 Mrs. David Hwang has given review about our services and hospitality.There view point about transportaion, services, hotels, drivers and guide is described here. 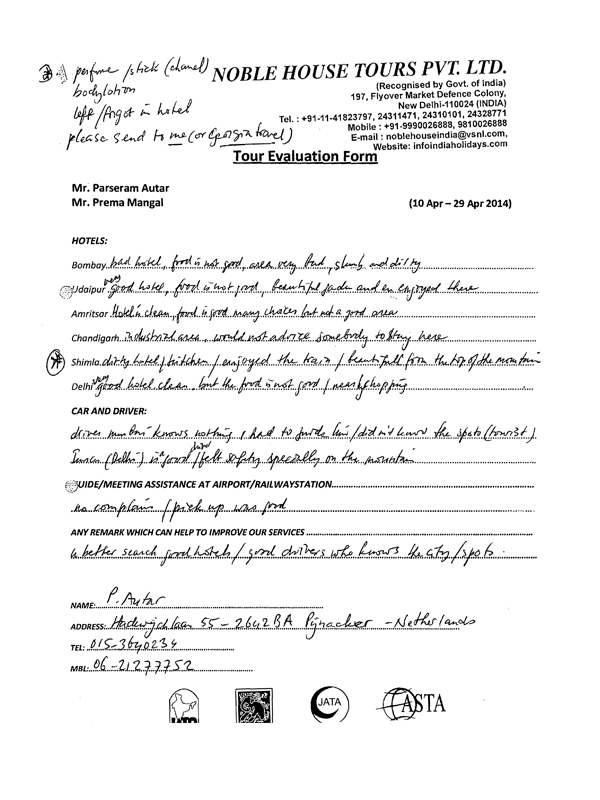 To read complete review please click on the image and get handwritten review by our clients.